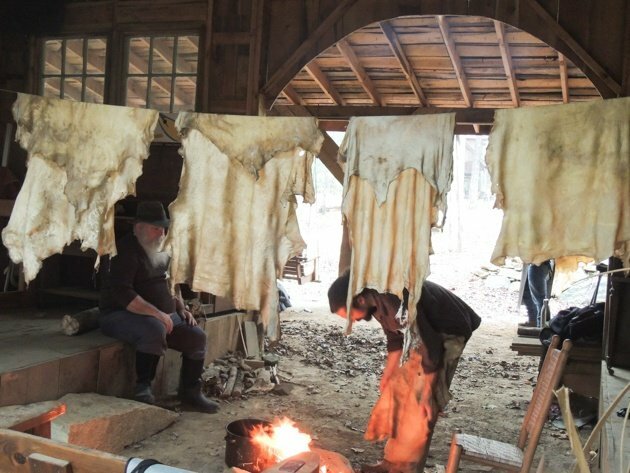 Wearing deerskins, was once as common as wearing blue jeans today. 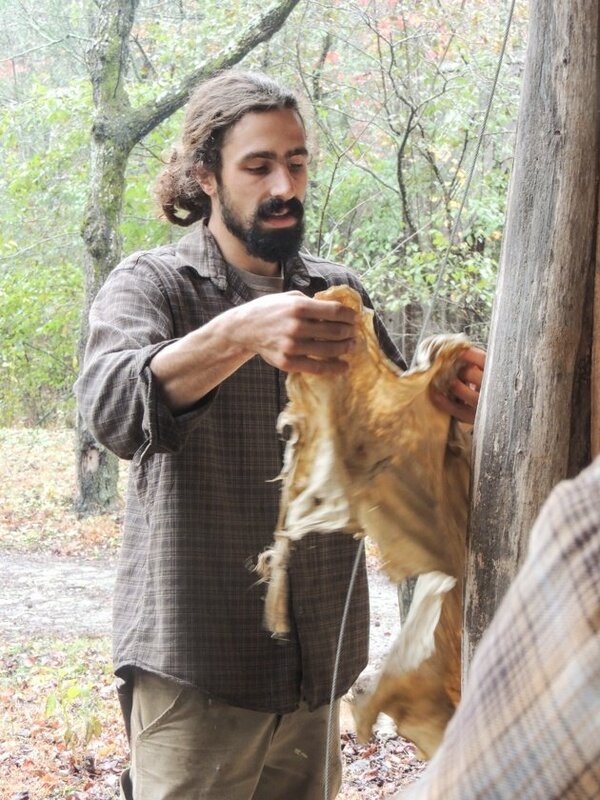 Deerskins were the most commonly tanned by Native North Americans because of their availability, durability, and softness. 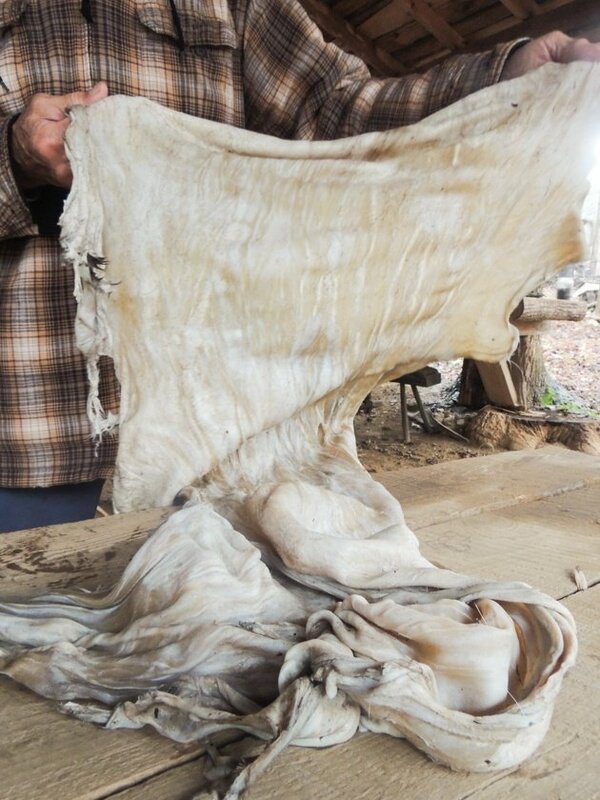 Other animal skins were also tanned and used in various ways, but deer skins were the basic and the most common “fabric” back then. 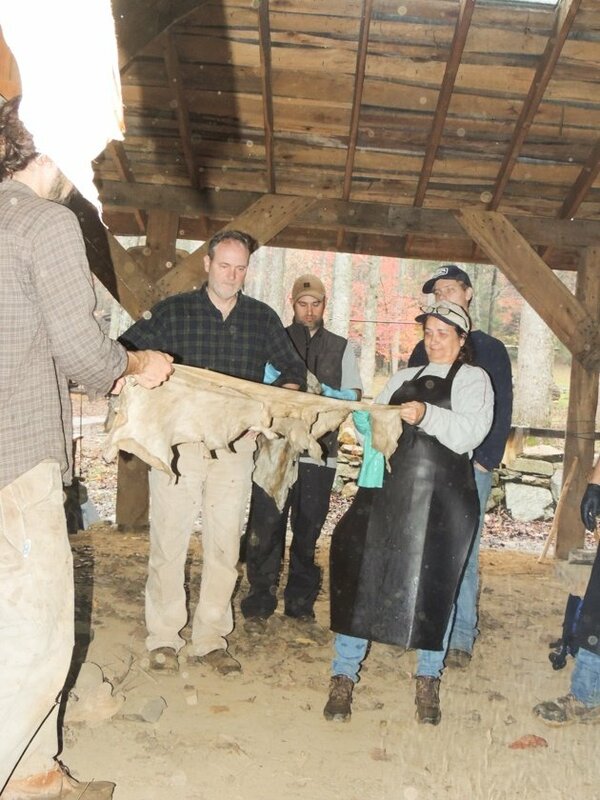 I first became interested in tanning deerskins after we butchered a couple of deer. The first couple times the guys brought a deer home I was so happy to have all this fresh, healthy meat that I didn’t think much past the full freezer. Then, little by little, I started thinking to myself how else can I respect and use this wonderful creature that gave its life for me. Using the skin was one of the first things I thought of. I found a class offered by Turtle Island Preserve and, in dire need of a breather, I signed myself up and headed to the mountains. It turned out to be the most amazing weekend I have had in a VERY long time. The place is magnificent! All primitive and simple, yet sophisticated and so real. If you ever tried to build a driveway or a cabin by yourself, you’ll know right away how much effort and how many hours went into creating that place. A lifetime of work that I have so much respect for (I’ll have another post to show some pictures of Turtle Island soon). 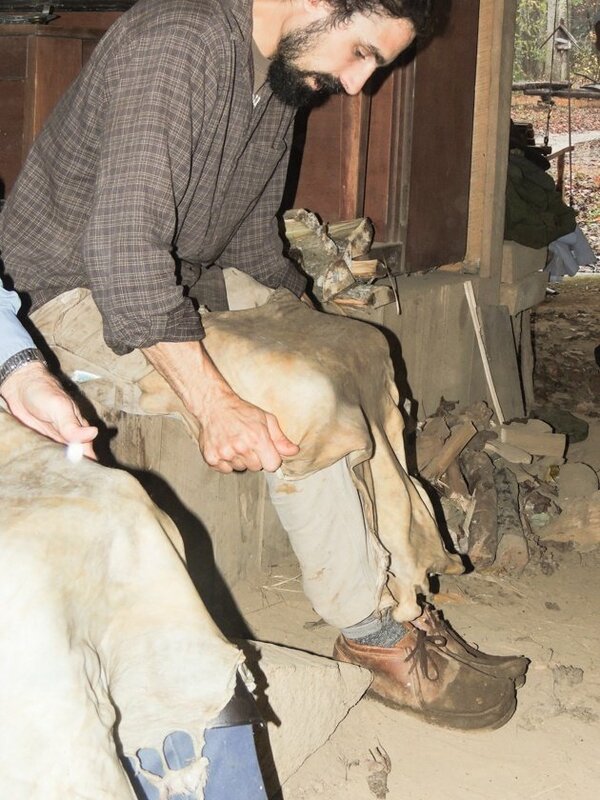 And the people…In our modern world, when you are deep into all this homesteading and rewilding stuff, you constantly have to explain yourself sometimes almost convince people that you are not completely out of your mind. How fabulous it was to be surrounded for a whole weekend by people who get you. They just know the value of eating a meal from a wooden bowl you carved yourself; they get it, no need to explain. It was a simple but truly amazing experience. 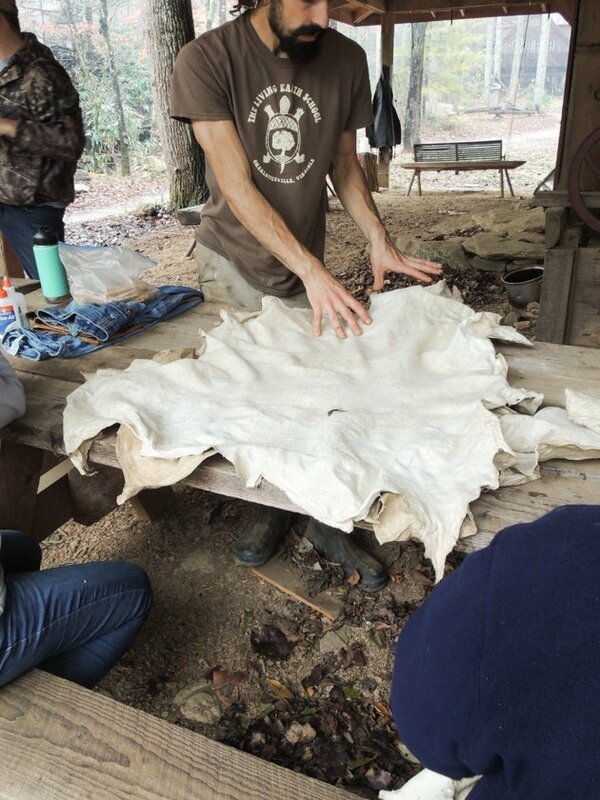 We went from raw deer hide to workable leather in less than three days, which means we worked hard. Super hard. I’ve discovered that there is a thing I call Tanning Shape; you don’t need a gym if you tan hides the traditional way. I took many pictures so I don’t forget the process we’ve went through and, of course, to share with you. 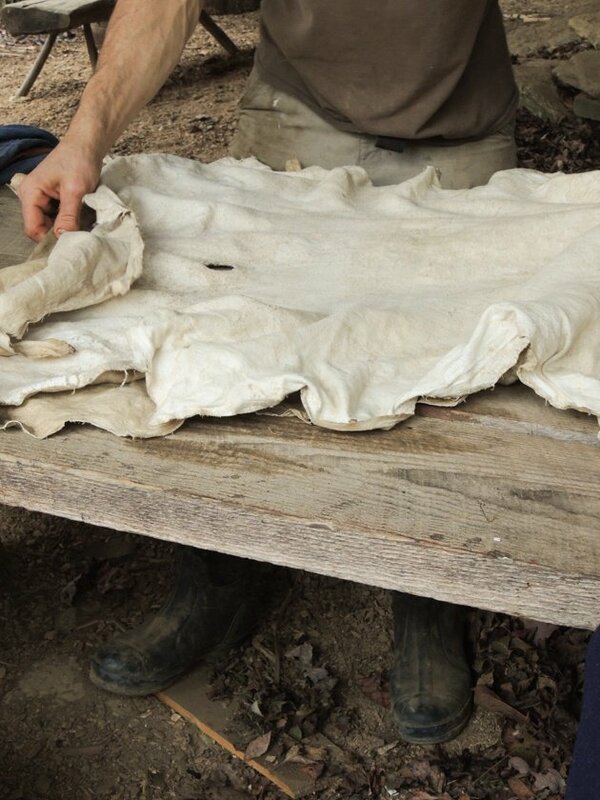 The process you’ll see in the picture tutorial below is the traditional way of tanning deer hide with brains (traditionally the deer brain but it might be any animal brain). They say there are as many ways to tan a hide as there are hide tanners. It’s an art, you learn the basics and through practice you create your own unique way of doing this. There is a lot of information I wanted to include. Like options for various tools you can use, other options for doing certain things, what to do with the finished product…but it will be too much for one post so I’ll keep on adding information in the future (make sure to sign up for my newsletter so you can be notified). In this post we will concentrate on the tanning process only. Before we get started, let’s get on the same page here. What is it that we are about to do? We are about to make buckskin. 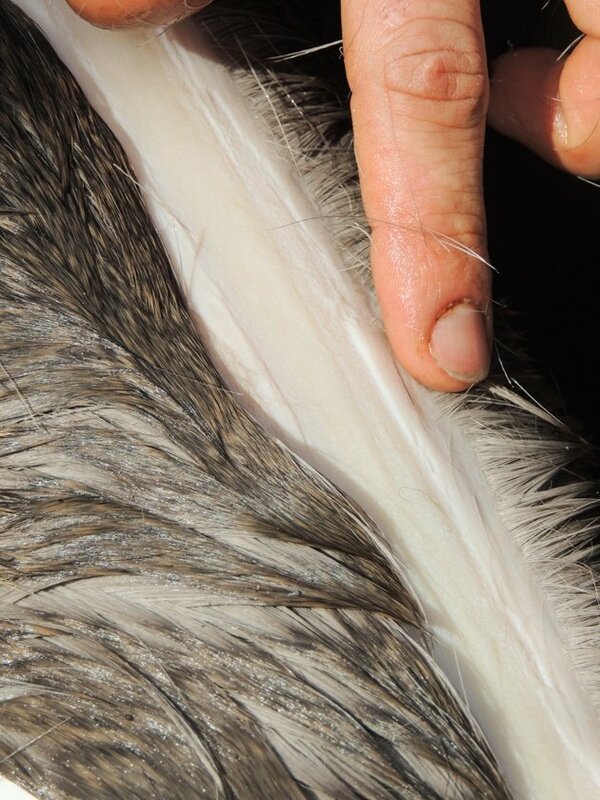 Buckskin is ANY hoofed animal hide naturally tanned with animal brains after removing the hair and grain (the layer under the hair). 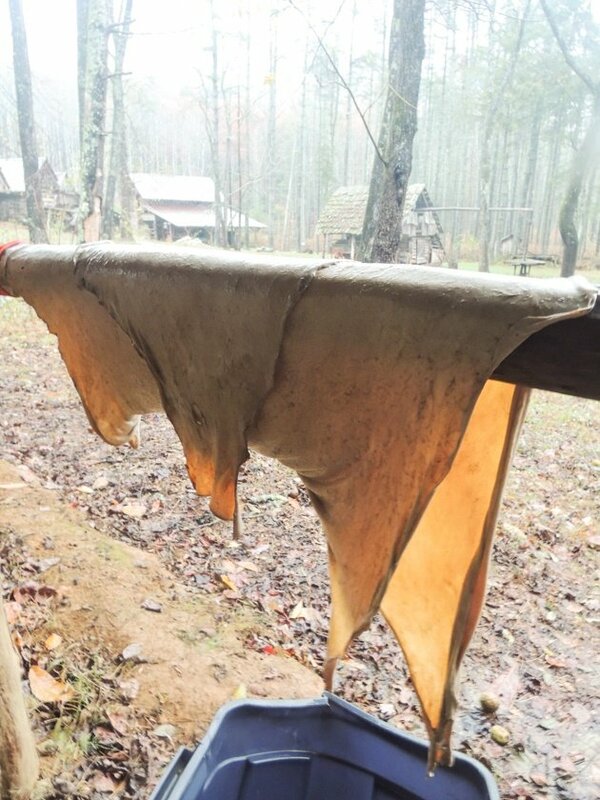 The resulting leather is called buckskin because of the natural brain tanning process, not because of the deer. Buckskin can be processed from goat, elk, deer, sheep, antelope, buffalo, and even cow. Buckskin is tough and very strong, yet soft and flexible making it ideal for clothing and footwear. It’s also great for pouches and handbags, however, take into consideration that it is not waterproof. 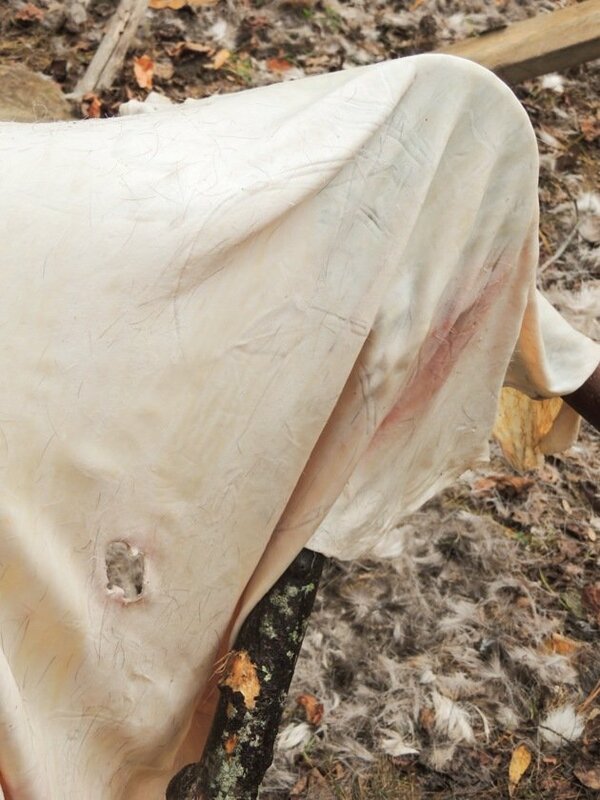 If you hunt and butcher your deer yourself, obviously you’ll get your hide from the deer you hunt. But I’ve learned that you can also go to a local meat processor during the hunting season and ask for deer hide. We butcher on the homestead so I never realized that some people take the deer they hunt to a processor. But apparently many hunters do. The processor butchers and packages the meat for them and usually throw away the hide and the head. I’ve learned that many processors will let you pick them up for free from the dumpster, you just want to make sure you show up when the hide is still fresh. 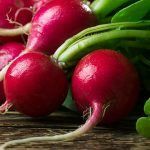 If you live in the city and have no clue where a processor is, just look up a meat CSA in your area. They are probably taking their animals to a processor and most likely will be able to tell you where the processor is located. Contact the processor and ask if they can give or sell you the deer hide and the head so you can get the brain. Another option if you don’t hunt is to find people in your area who do and ask if they are using the hides. Many don’t and will be happy to give it to someone who will do something with it. Once you have a hide you have two options: You can start working it right away or you can preserve it for later. Freezer – the easiest option is to fold the whole thing and throw it in the freezer. You can throw the whole head in there as well. We got two deer this season before I took the class. I didn’t want to mess anything so I simply folded the hide, put it in a garbage bag and placed it in the freezer. I also put the whole head of the animal in there because I wasn’t sure if there was a certain way I was supposed to extract the brain. There isn’t and we will go over this later, but I won’t do this again because it takes a whole lot of room in the freezer and freezer real estate is in very high demand during the hunting season. So next time I’ll extract the brain, place it in a ziplock bag and store it in the freezer this way. If you got a buck and it has antlers, make sure you save those as well for your buckskin project. You can use them for buttons and such. 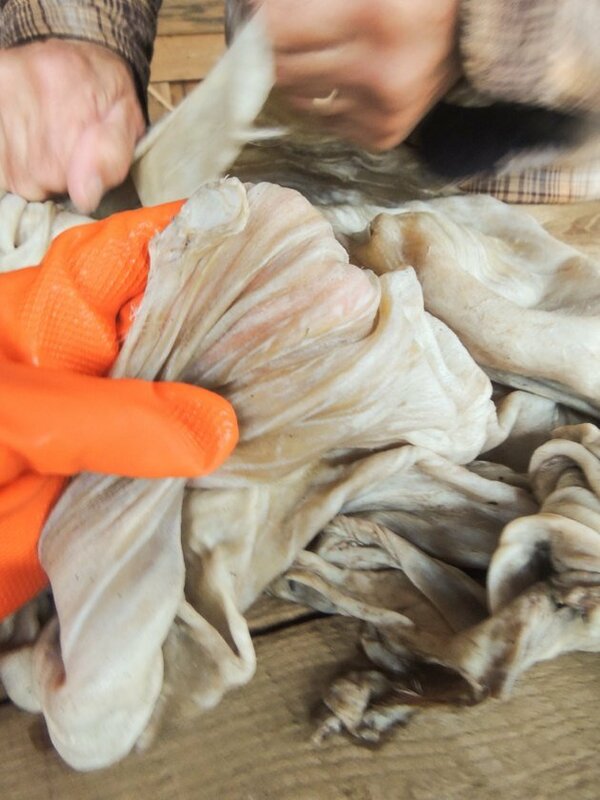 Flesh and Dry – your second option is to flesh the hide, stretch it and let it dry. 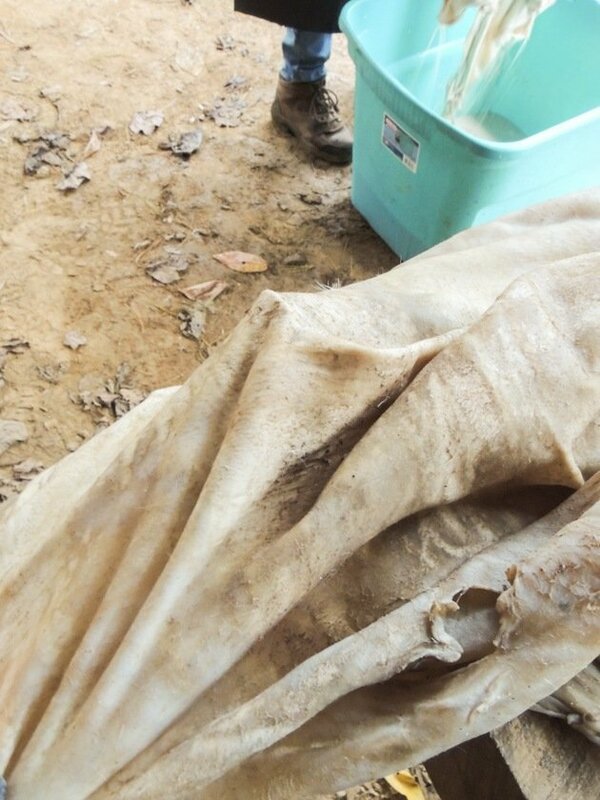 The hides we used were already fleshed so I don’t have pictures for you of fleshing, but fleshing is simply cleaning the hide from the animal’s flesh. 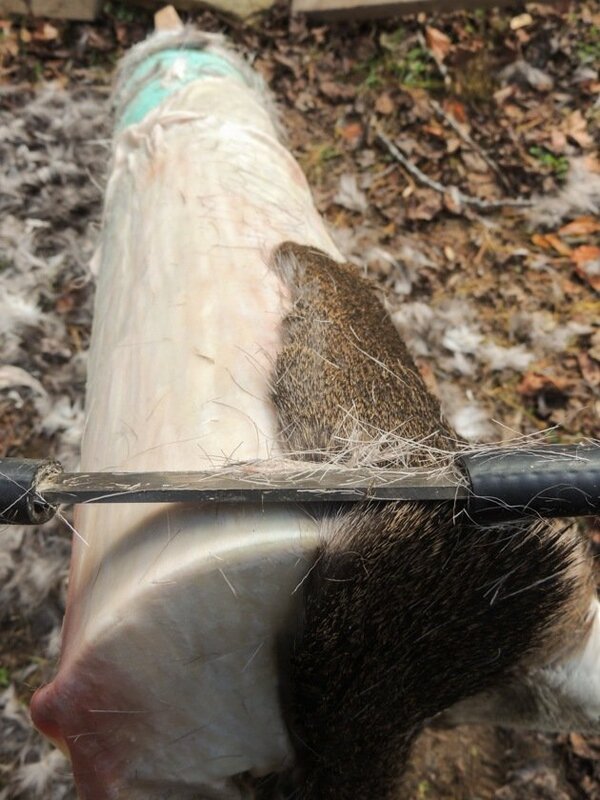 You will place your hide on a beam like the one you see above, hair side down, and using a fleshing knife you scrape off the little pieces of meat, fat, and the inner membrane that are left on the hide after skinning your animal until the hide is clean. 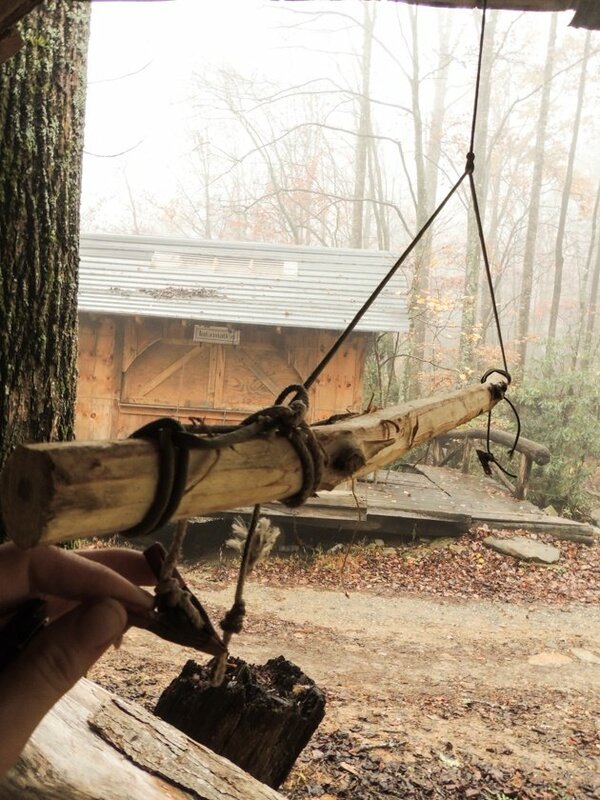 This beam above is what Tyler (our instructor) called his traveling beam. 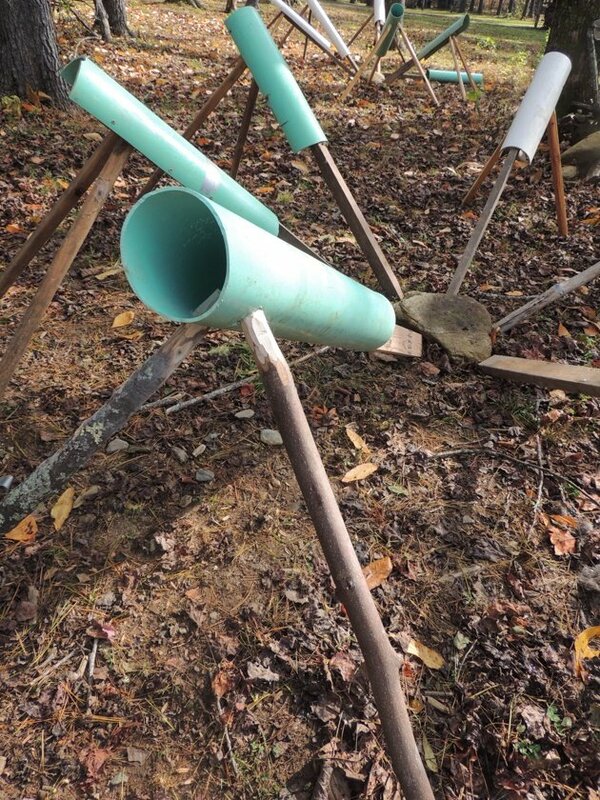 It’s easy to put together using a 4” PVC pipe, a 2×4 and a couple of sticks for legs (when I got home I made one from a 5′ 4” PVC pipe without the 2×4, It cost me $15 to make it). It’s easy to take apart and move yet surprisingly steady. 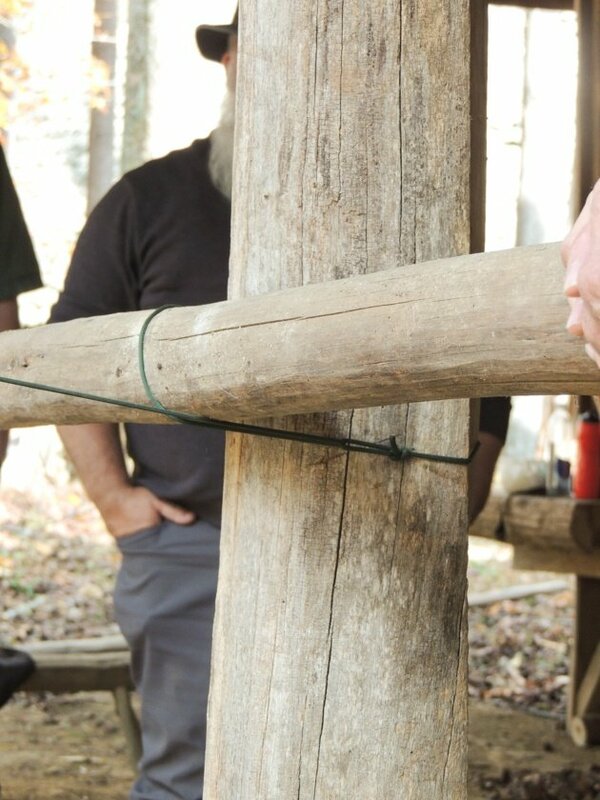 You can make a beam from a log (you’ll have to debark it) or come up with a different idea. 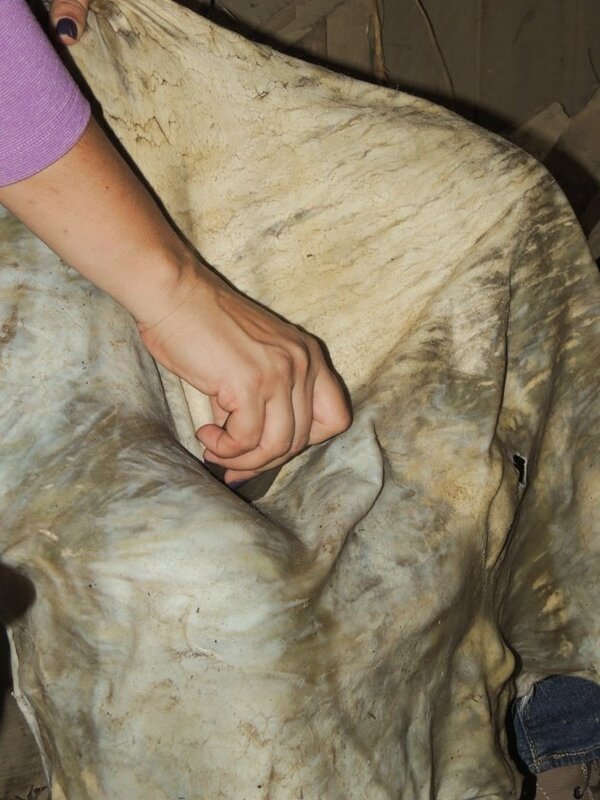 Once your hide is clean you can stretch and nail the hide on a piece of plywood (hair to the plywood) and let it dry. 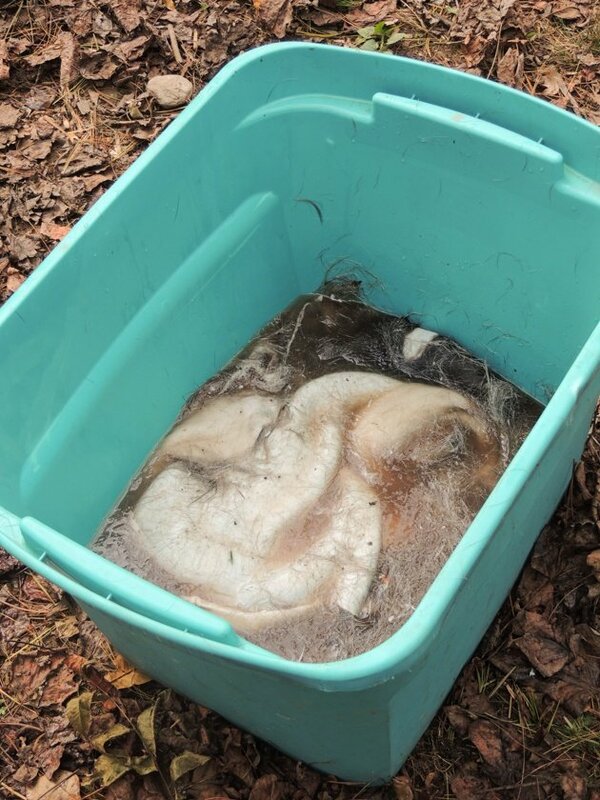 Make sure it’s in a dry, well-ventilated place away from your dogs. Once the hide is dry you can store it in a bin for a long time, however, make sure to check the hide for hide beetles once in a while. They are only a problem if you store your hide with hair. If you spot them, you’ll have to work your hide immediately. 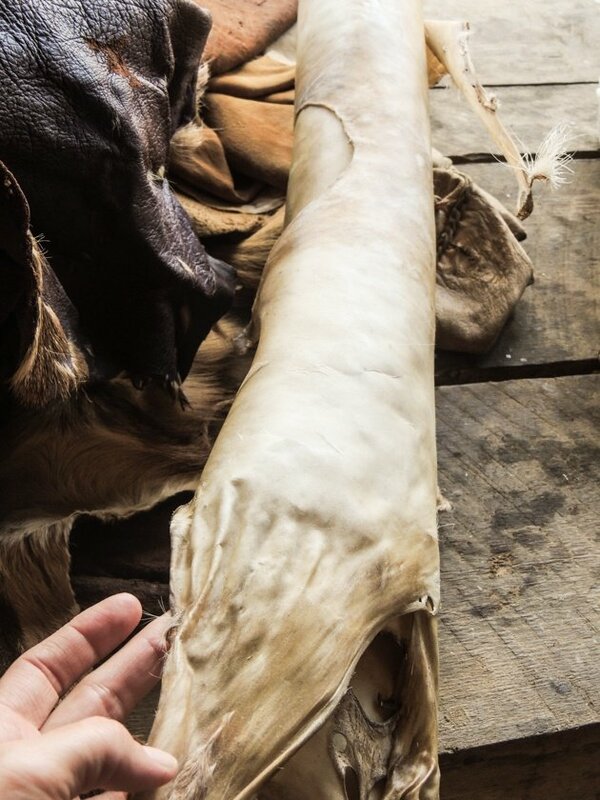 Flesh, Dehair, Grain, and Dry – here, you will flesh the hide after skinning the animal, then, turn it over on the beam, and dehair and grain it (we will go over how to do this in a minute). Then, you’ll stretch it on a plywood or a frame and let it dry. You can then roll it and save it dry until you are ready to work it. 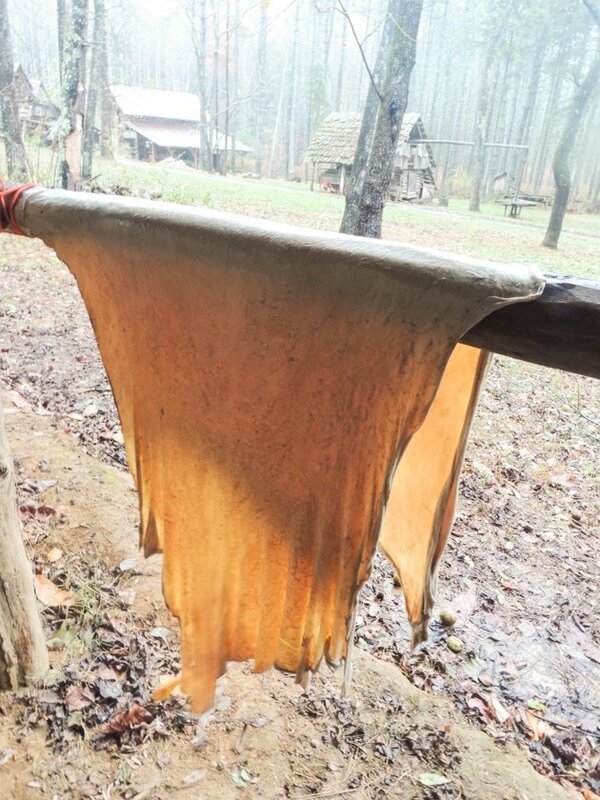 Any way you choose to preserve your hide, you will need to soak it in water for 12 to 24 hours before starting to work it. 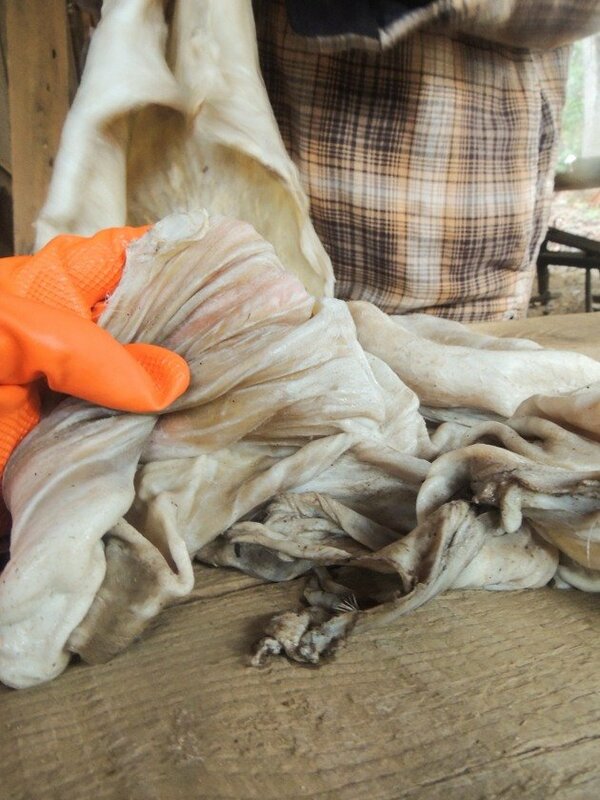 The hides we worked in the workshop were already fleshed and kept in the freezer for us, then soaked in water the evening before. Dehairing means removing the hair. Graining means removing the grain layer that is under the hair (the epidermis). This layer is composed of densely packed dead cells that provide protection to the live cells underneath. 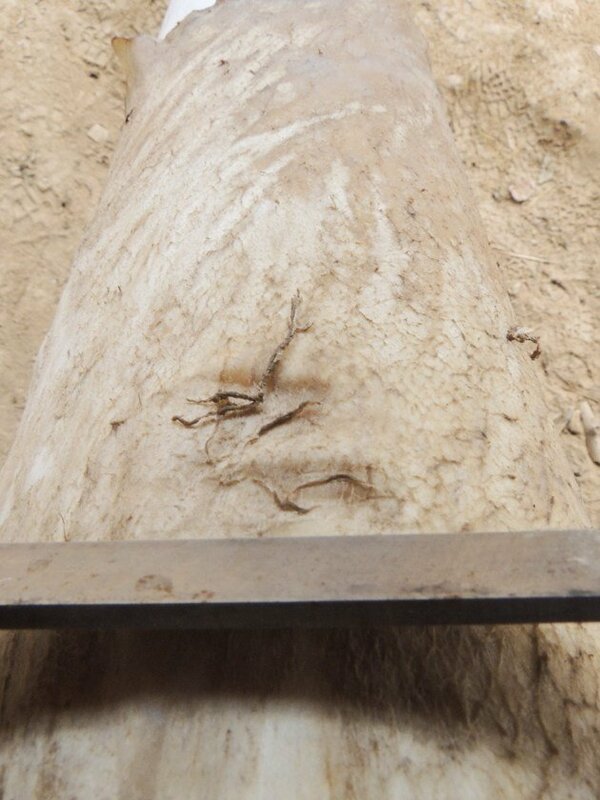 If the grain layer stays on the skin it will prevent the brain solution from penetrating the hide and thus we won’t be able to soften it. Dehairing and graining are best done at the same time in this method since it’s a bit hard to recognize the grain once the hair is removed. 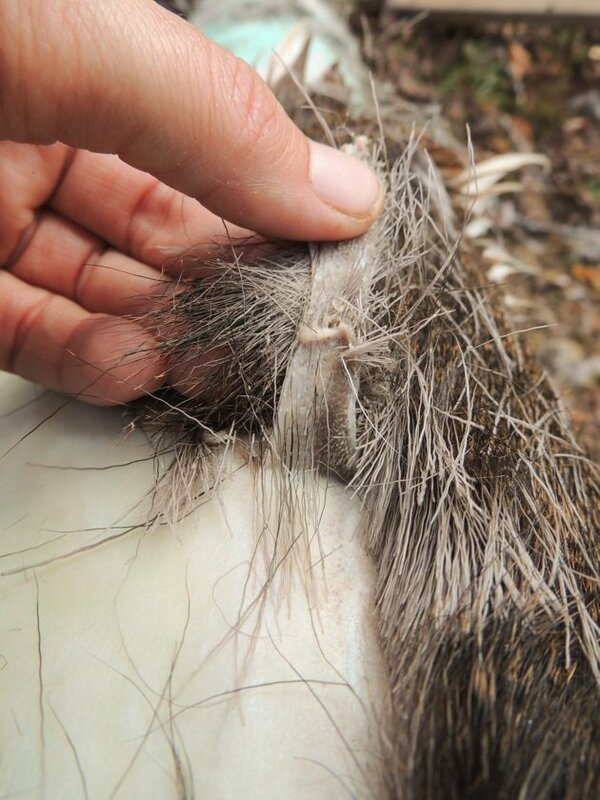 You’ll start by placing the hide hair side up on the fleshing beam. Turn it so the hair growth is sideways and with the fleshing knife work on removing the hair from a small patch. 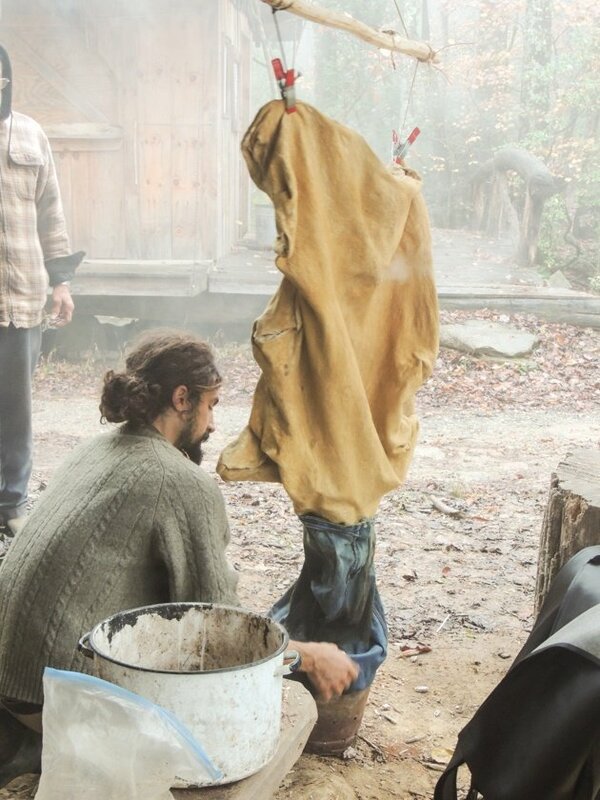 Notice in the picture above that Tyler is wearing an apron and that he is holding the hide to the beam with his lower stomach. Turn the hide so you work with the direction of the hair. Work one strip of hair at a time until you are sure it’s clean of grain. In this picture the grain is clear. See the puffed area Tyler is pointing at? This is the grain. You want to remove it with the hair. Since it’s the same color as the rest of the skin I found that it’s hard to recognize it once the hair is gone. 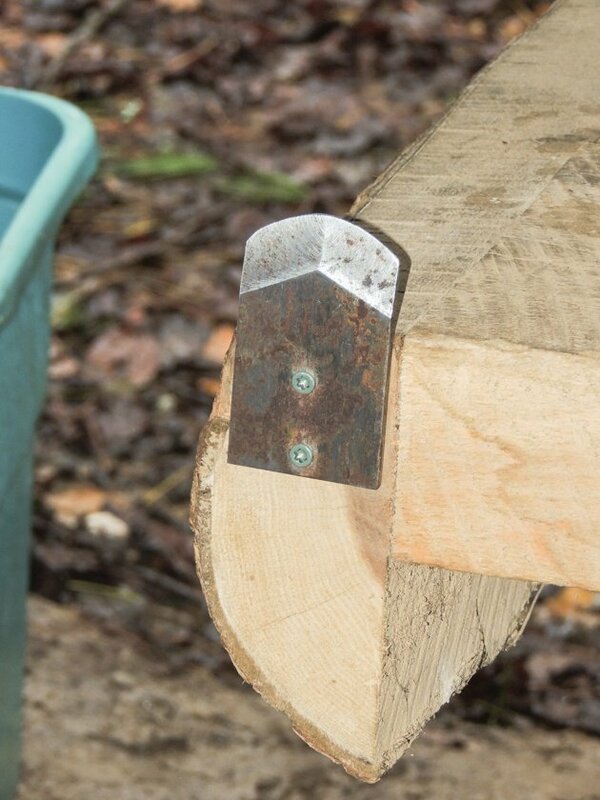 To do this, place your knife at the top, and push down hard. I mean HARD! You won’t believe how tough skin is. I thought for sure at any moment I was going to tear it but no such thing happened. (Note that today there are all kinds of chemical formulas that you can purchase and soak your hide in to make this process easier, but this is natural and simple, just like the Indians used to do it. The exercise will keep you healthy anyway). 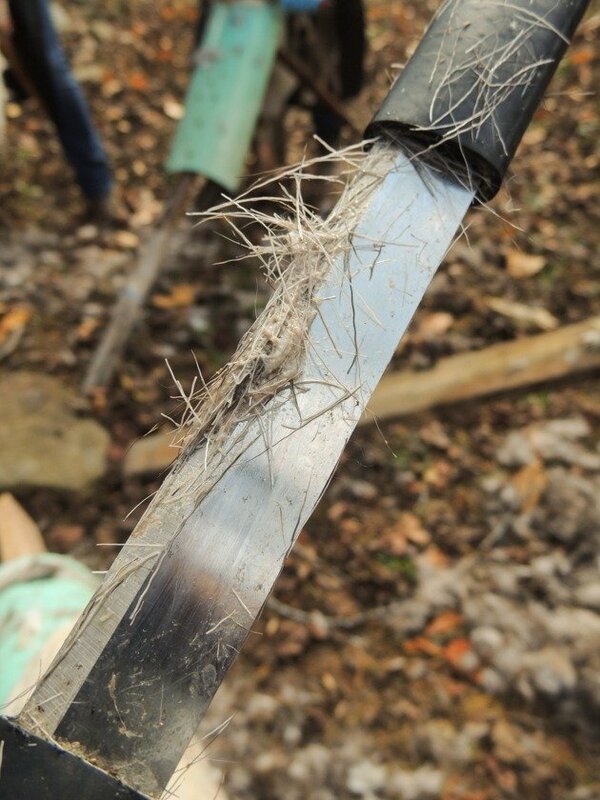 It will take a little bit of time to gauge the amount of force you have to put into it but once you have it you’ll be able to dehair and grain at the same time. I must add here that the fleshing knife you use here (and when fleshing) is not a sharp knife. You’ll notice it when you buy it. It scrapes the skin but it doesn’t tear it. 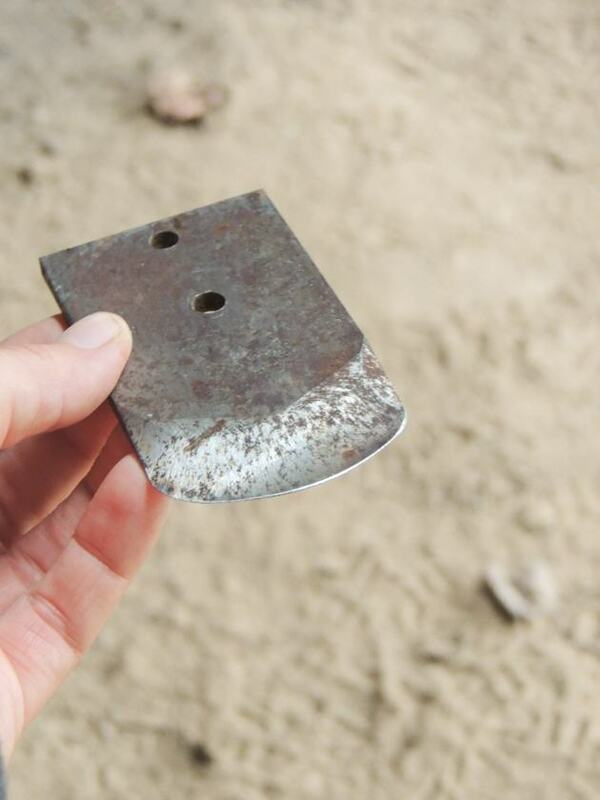 If your knife makes holes in the skin, it is too sharp. Work it and work it and then work it some more. 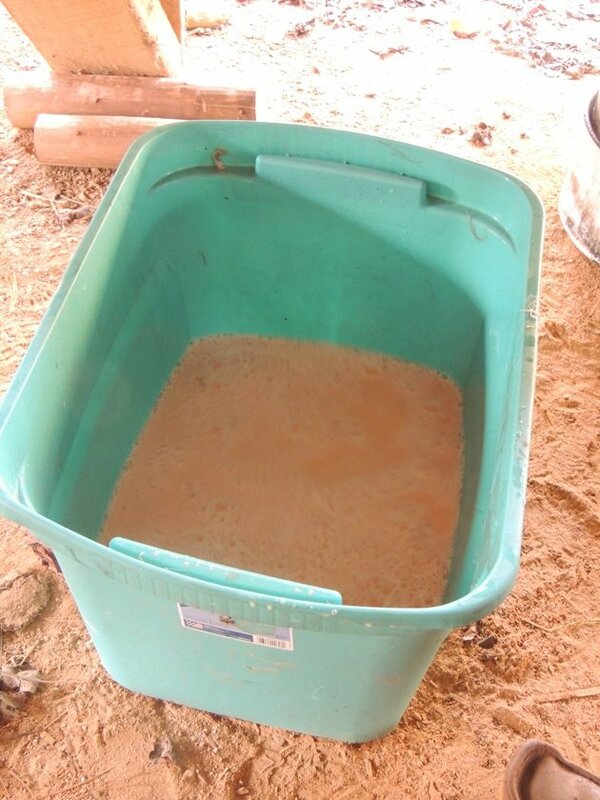 If you feel like you need to rest just place the hide in a water bucket (again, make sure your dogs can’t reach it). Turn the hide this way and that way to allow you to get all the hair and grain off. As long as your knife comes up with grain, keep at it. Don’t worry too much about the edges though. If there is a tough spot at the edges (I noticed that on the neck especially) you can cut it off. After a couple of hours of hard work, you’ll have a really nice white piece of skin. This was the hardest part for me. I would have loved an hour of massage therapy right then but only if my hide was going with me. I was completely in love with it at this point and wasn’t going to leave it behind for anything! 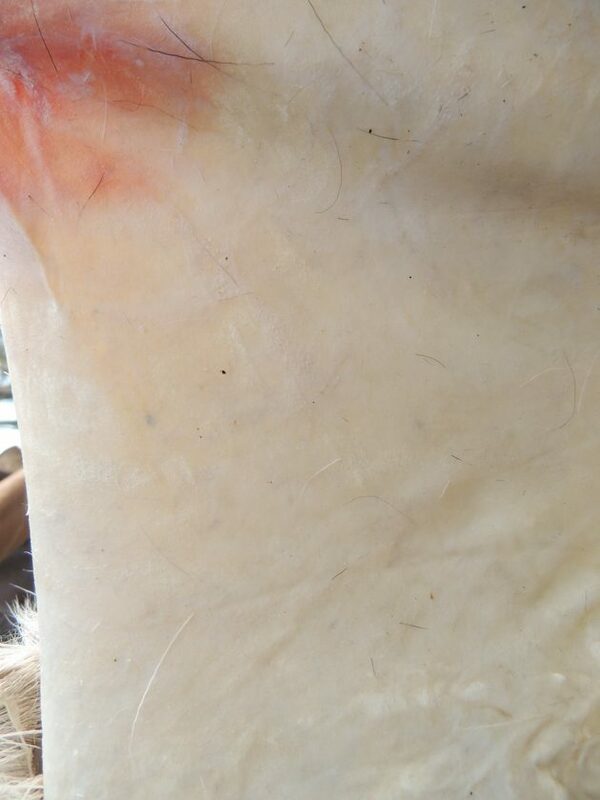 Now that the dehairing and graining are done, we want to flip the hide and work on the other side, the membrane side, the side that we fleshed after skinning. All we have to do here is scrape it for a few minutes in order to open it up so it can accept the brain solution. You won’t see anything special here, there won’t be anything coming up on your knife and this should take about 15 minutes or so. Just scrape all over. The next step is soaking the hide in an acid bath. 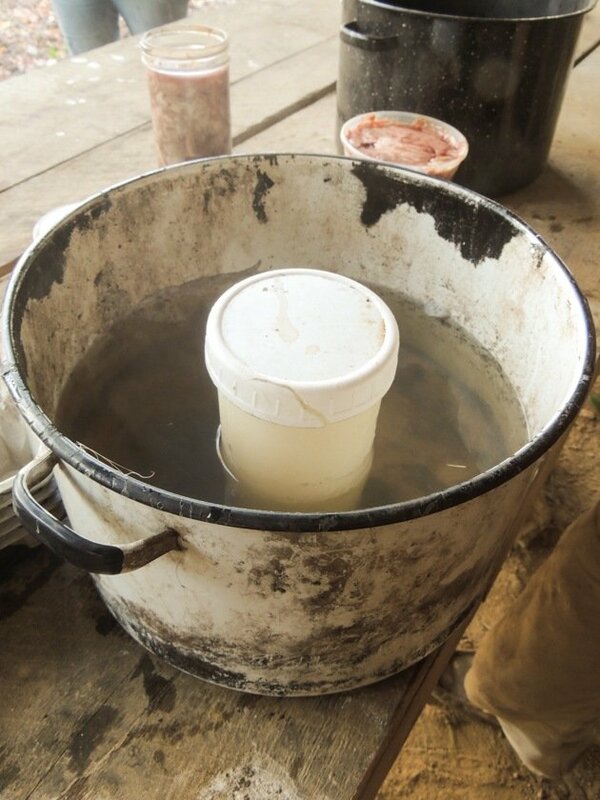 To make an acid bath, simply add 1 cup of any available vinegar to a 5-gallon bucket of cold water. Wash the hide (hose it with cold water) to get rid of all the hair and clean it up a bit and set it in the acid bath for about 30 minutes. If after 30 minutes it feels too rubbery you can wash it in cold water. I think it takes a bit of experience to recognize how it should feel but don’t make too big of a deal of it. We are going to wring the hide of all the liquid next, if it doesn’t cooperate and is too slippery, go ahead and wash it in cold water. Before the hide goes in the brain solution it should be fairly dry. 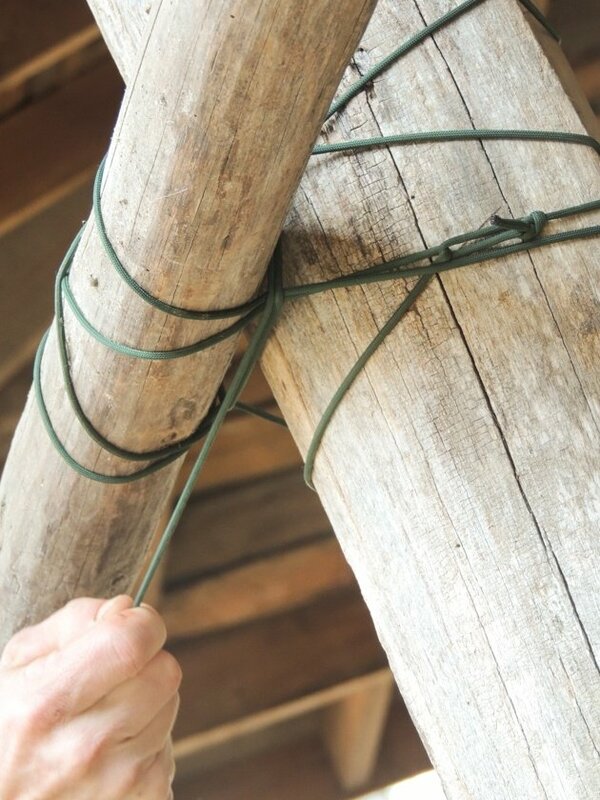 To make a wringing beam, we tied a debarked beam horizontally between two vertical posts. Making sure they are tied together well. Until you get what they call a doughnut ring. You don’t want your doughnut to be too long (the one in the picture above is a bit long). 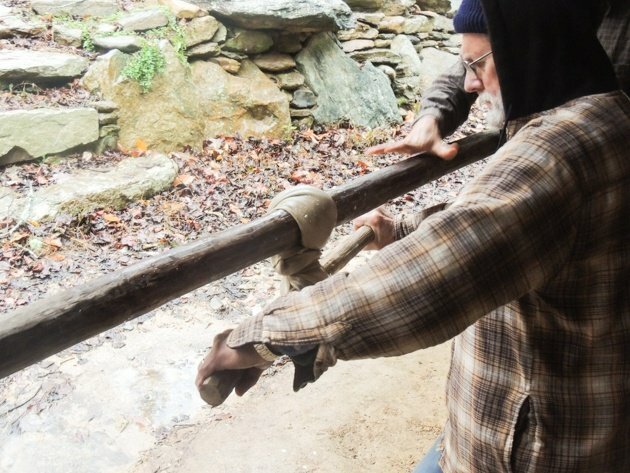 Insert a wringing stick (just a wooden debarked very strong stick that is about three feet long) into the middle of the doughnut and start turning. Turn and turn and turn until you can’t turn anymore and just hold it in place squeezing as much moisture out as you can. Again, you won’t believe how much force you need to put here. 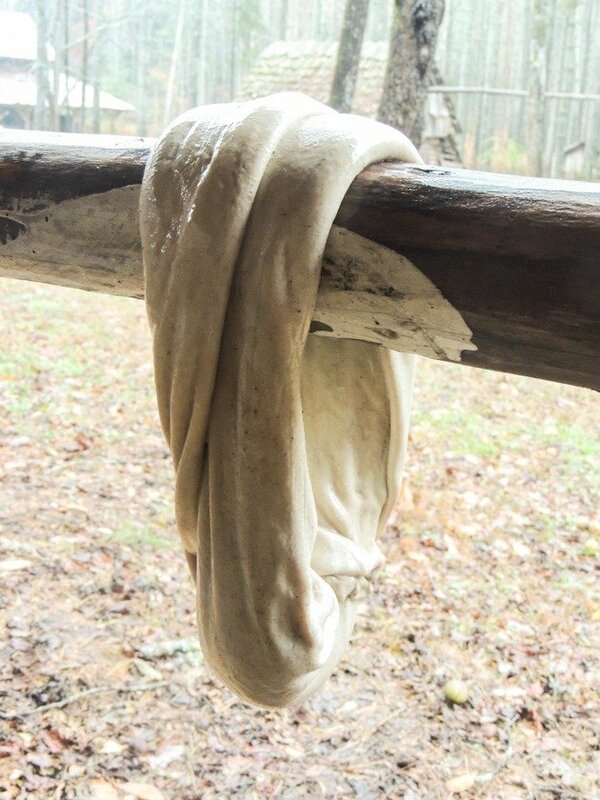 The first time you do this, when the hide is very wet, it might not stay in the doughnut. It can get a bit frustrating because it’s slipping and sliding all over the place. Do the best you can to get some liquid out of it the first time, don’t worry if ends are coming undone and slipping out of the doughnut. Then undo the doughnut, stretch and open the hide, fold it into a doughnut again and do it again. The second and third time will be much easier. Also, make sure to turn the doughnut on the beam and to turn your wringing stick in the opposite direction as well. Here is how it looks when you open it up. It has the consistency of Laffy Tuffy. And another. 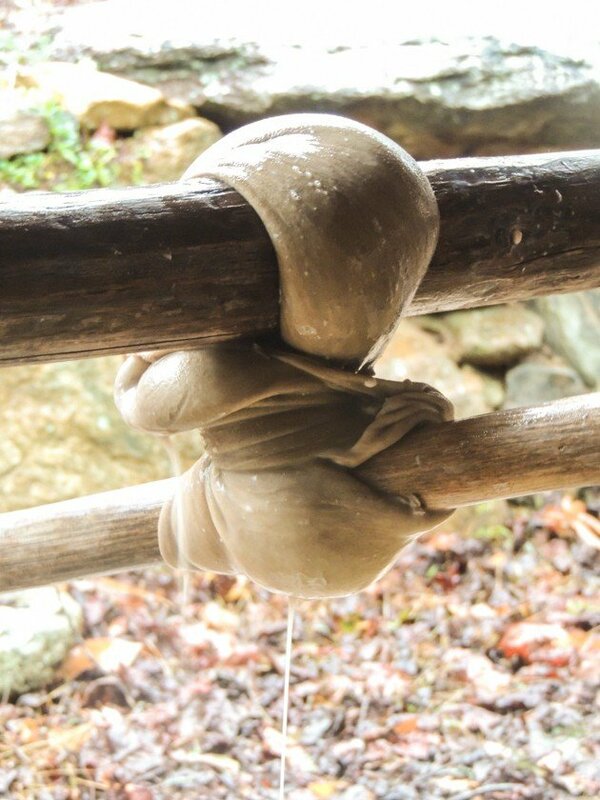 If it still feels wet, go ahead and fold it into a doughnut on the beam again and squeeze more moisture out of it. 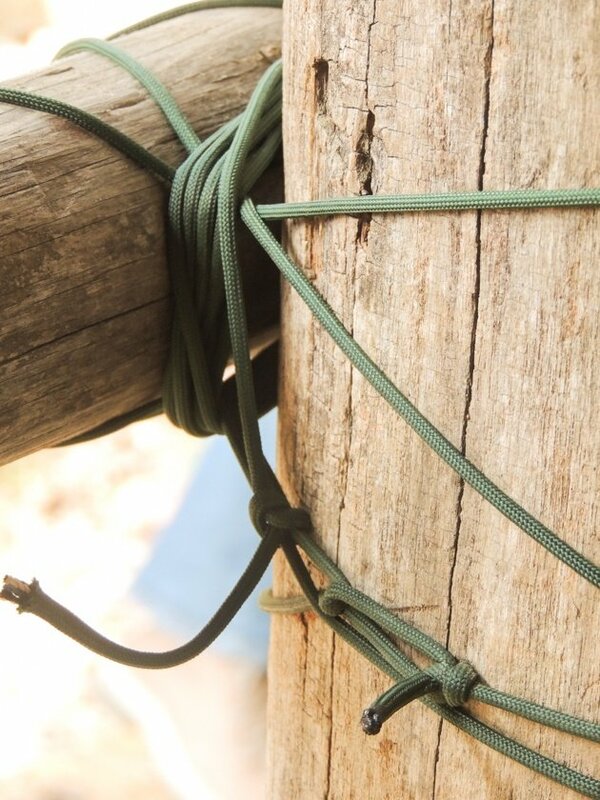 Then take it down, stretch, hang to dry, stretch, hang to dry… Until it’s fairly dry. It was a bit cold in the mountains so we had to hang out around the fire a lot. 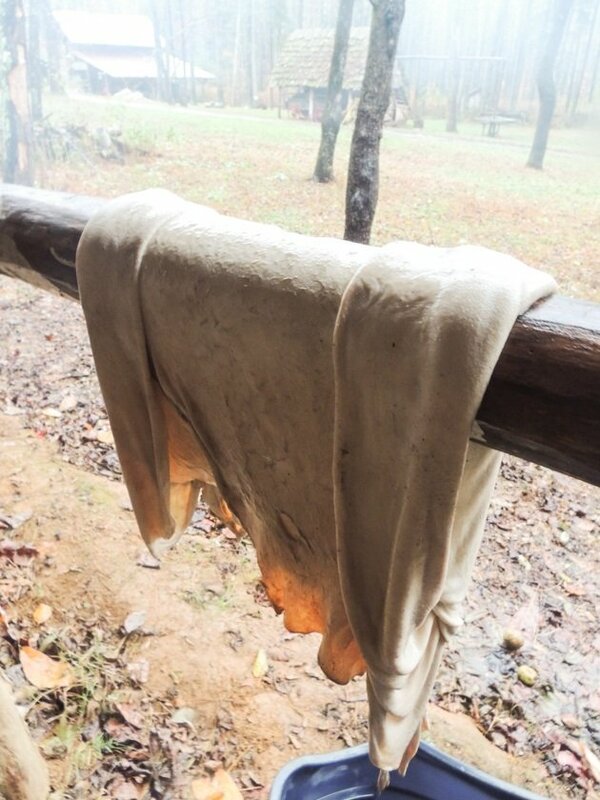 It took longer to dry the hide this way. Ideally, you’ll do this on a 65F day with a light breeze. You don’t want to set your hide in the strong sun though. You can also bring it into the house, and if you have things to do and you don’t mind it waiting for you for a few hours then that’s fine too. No rush. You know that a hide is dry when it feels warm against your cheek. If it’s cold to the touch, it still has moisture in it. Making the brain solution – you can use any animal brain you can find. If you want to use the deer brain, you’ll go ahead and use a saw to open the top of the skull and scoop the brain out with a spoon (here is a picture tutorial on how to extract deer brain). 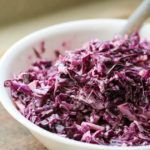 You can do this right after harvesting the animal and store the brain in a ZipLock bag or a plastic container in the fridge or the freezer if you want to preserve it. You might also find animal brains at the local grocery store or at the local butcher. I’ve never seen brains in our grocery store but I’ve heard that some will have cow brains or pig brains on hand. One gallon of warm water (pretty warm but at the point where you can comfortably leave your hand in the water for 5 minutes). 1/4 cup oil or fat. We used lard. Optional: to beef this up a bit you can add two egg yolks. 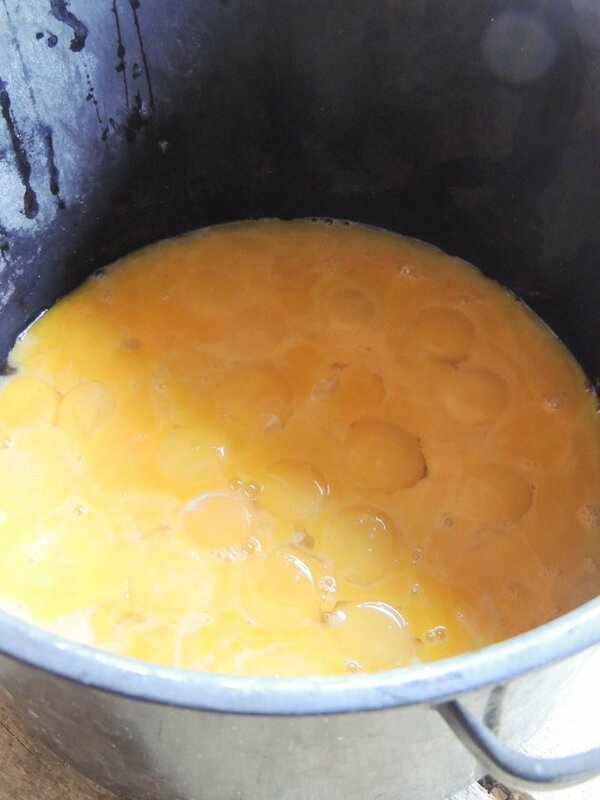 **Note: if you don’t feel comfortable using animal brains, you can substitute the 1 lb brain with 12 egg yolks. Also note that there is a risk of bacterial infection when handling raw brain especially if you have open cuts on your hands. Do not let this scare you, all you need to do is use gloves. Here is the brain. I can’t remember exactly but I think we used pig brain. And used a whole lot of eggs because we were tanning many hides. 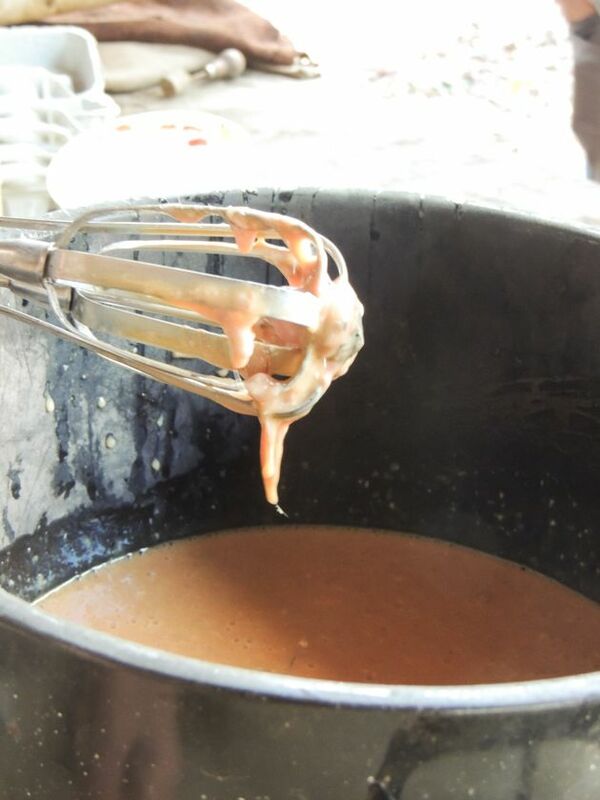 You add everything to a large pot and start mixing it. The brain is soft and dissolves easily. You can use a wooden spoon and your hands to do this. And place your hide in the solution. Remember the hide has to be fairly dry before it goes in the brain solution. Massage it in the solution for a couple of minutes and then let it sit there for at least twenty minutes or up to overnight. 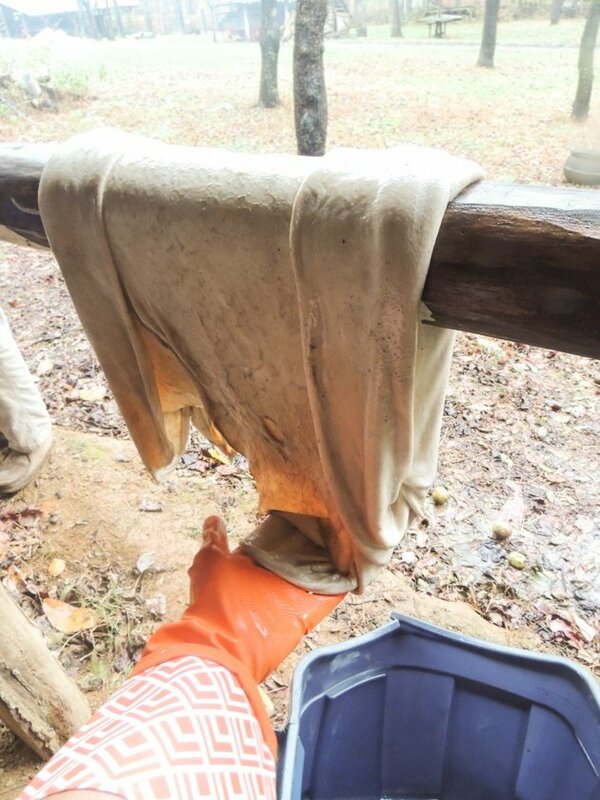 After your hide is done soaking for the first time you’ll take it out wring it just as before (place a bucket under the doughnut to catch the brain solution that you squeeze out because you can reuse it), then you’ll dry and soften the hide and then do the whole thing again. You should brain the hide at least two preferably three times. 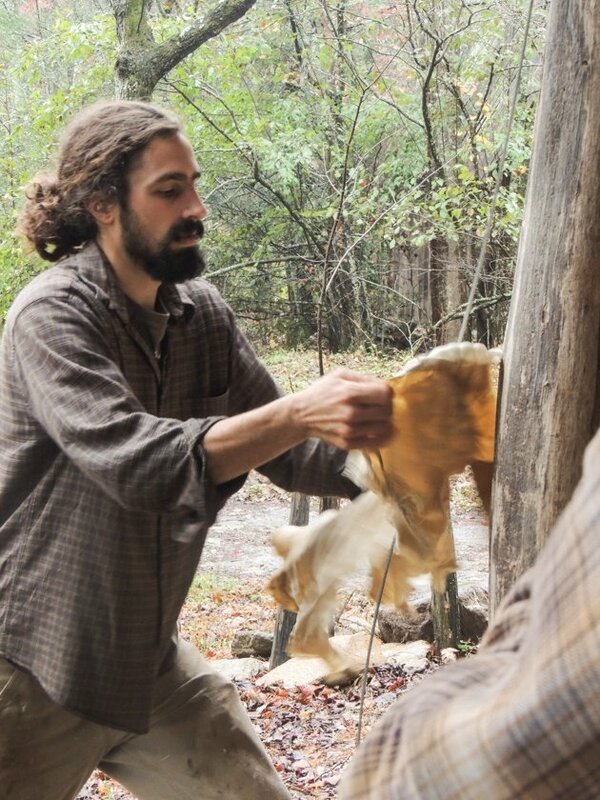 So you wring all the liquid that you possibly can out of the hide and now before you can brain it the second time you need to dry it and soften it. There are many ways to soften the hide. To scrape it on your knees. In this method make sure you use more force than movement. 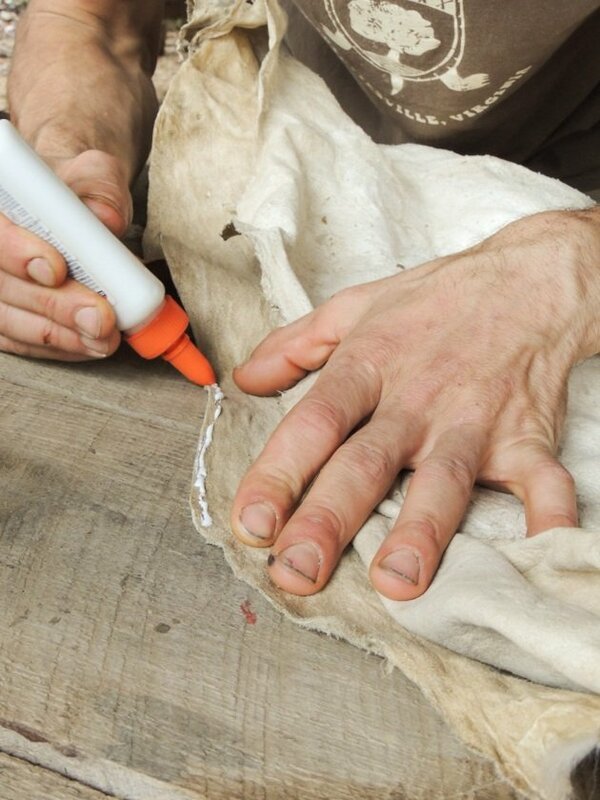 It is also important to remember here that you always work on the membrane side of the hide, never the grain side. 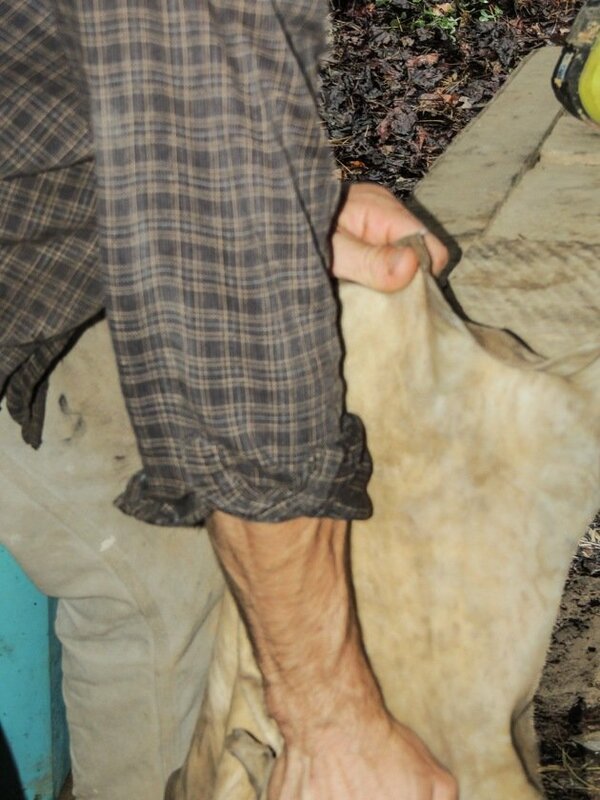 Place the hide on it and scrape back and force moving the hide around constantly. And pull it side to side letting the cable scrape the inside. You can see that softening is a lot of work but you don’t have to do it constantly. 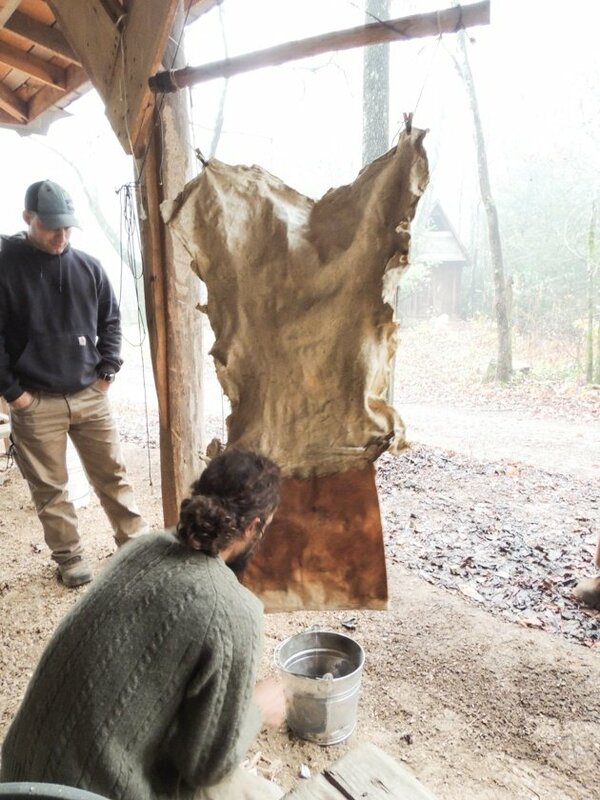 Soften for ten minutes, then hang the hide to dry for a little while and then soften again and so on. Another good thing to do here is to scrape the membrane side on the fleshing beam. You’ll notice a darker layer on the membrane side while softening. 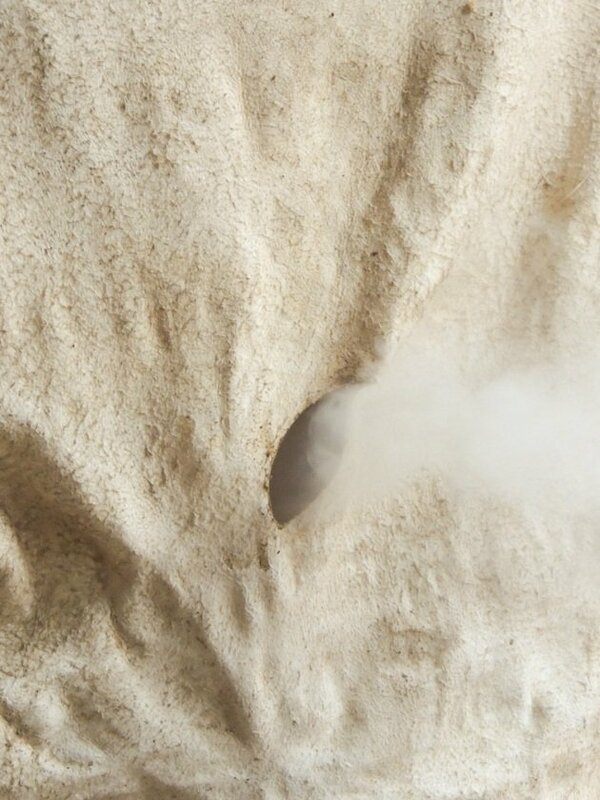 The more of it you can remove the softer your hide will be. You want to thin the hide and get down to the white layer. You want to remove as much as this dark stuff as you can. Lastly, this is also the time to sew any holes if you want to do that. 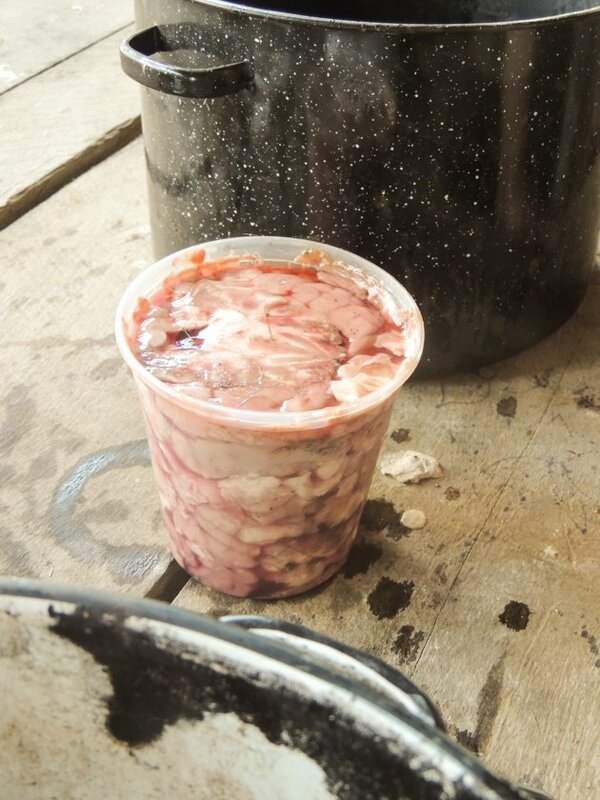 At the workshop, we did the braining process (soaking in the brain solution, wringing, drying and softening) twice and our hide came out pretty soft but you can do this three times if you want. 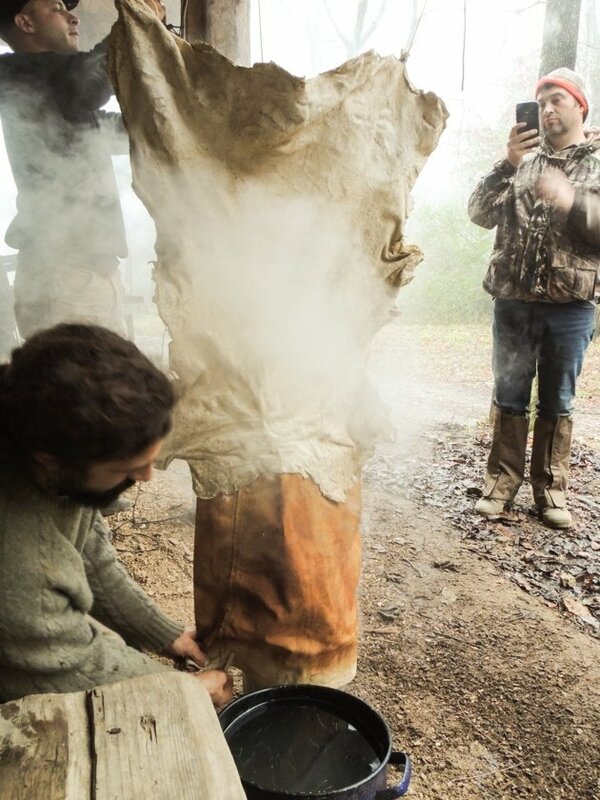 Once the hide is completely dry after the second or third time you’ve reached the final stage of smoking. 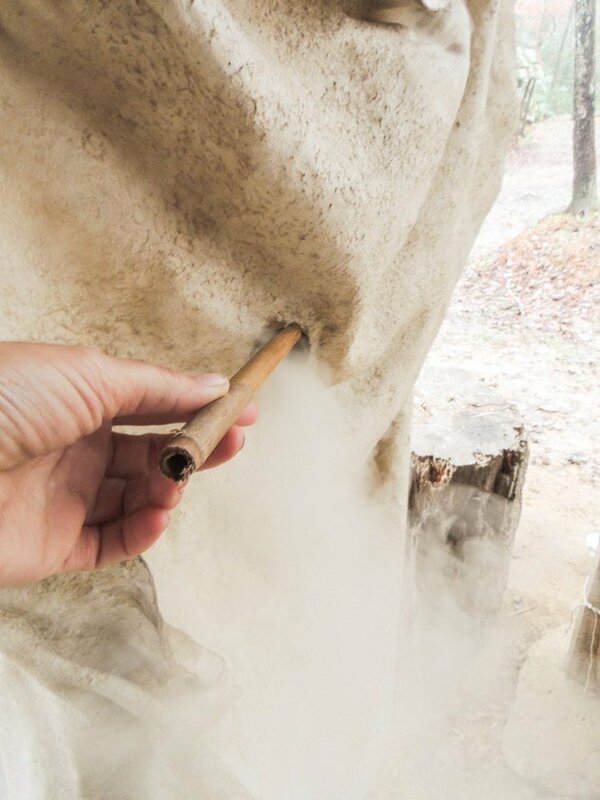 Smoking is a way to preserve the hide. 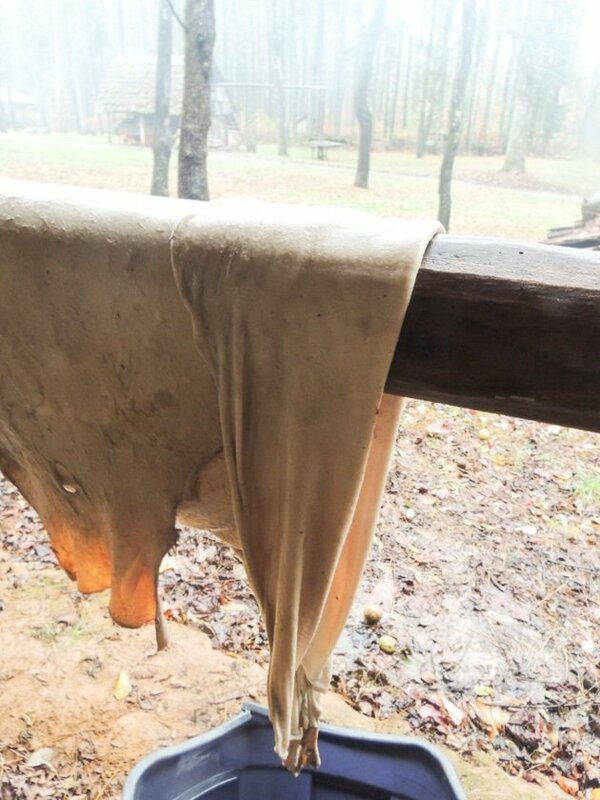 Before smoking, if the hide gets wet it will go back to being like a Laffy Tuffy. 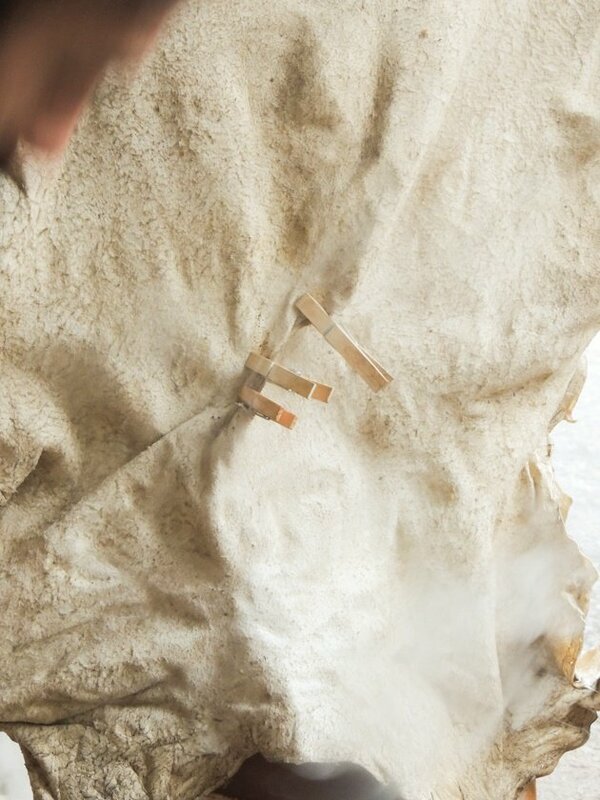 After smoking, if the hide gets wet it will dry up keeping its softness and flexibility. In the workshop, we smoked two hides at once. And using simple white school glue (which I’ve learned is actually hide glue made by melting hide pieces in water), glue the edges together. 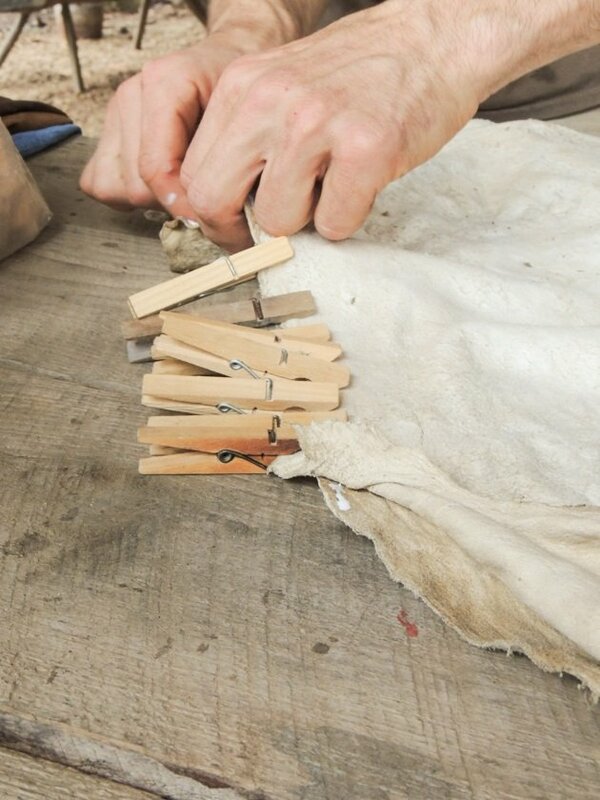 You can use clothes pins to hold the hides to each other until the glue dries. 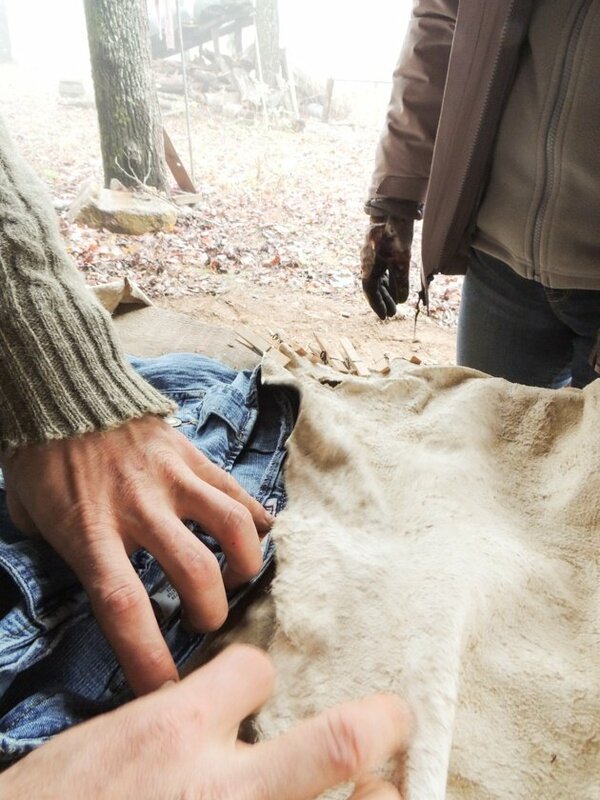 You can also staple the hides or sew them together. If you are doing one hide you can simply fold it in half. Then leave an opening at the neck to add a smoking skirt (which will be just a simple skirt you’ll get at the thrift store). 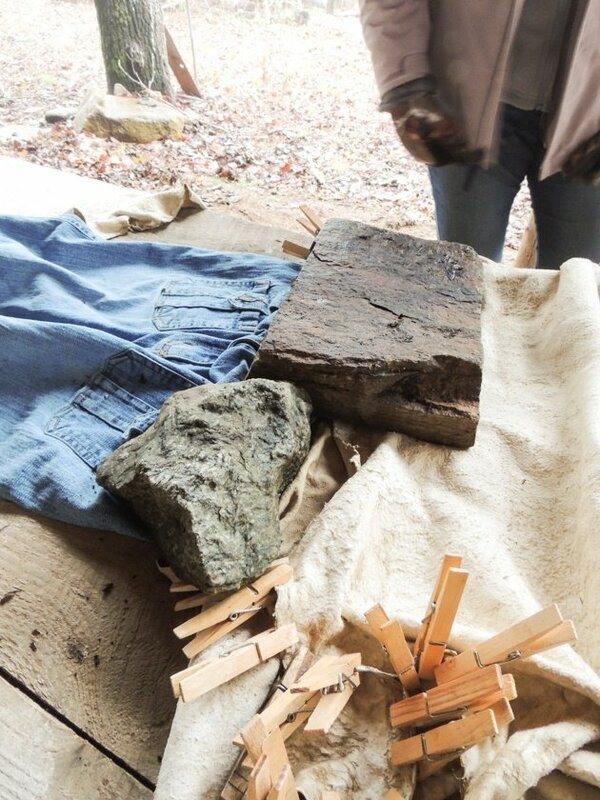 You’ll connect the skirt to the hide with glue and place a couple of rocks on it to hold it together until the glue dries. You’ll see in just a minute how it all comes together. Now let’s talk fire. 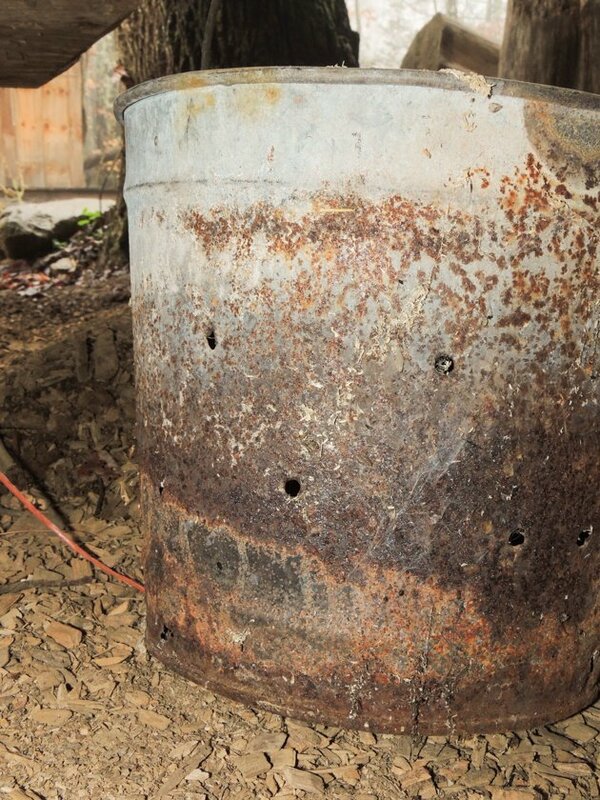 Get yourself a galvanized bucket and drill a few holes on the sides of it (towards the bottom). Just a few, we don’t want too much oxygen to enter because we don’t want a fire in it while we are smoking. 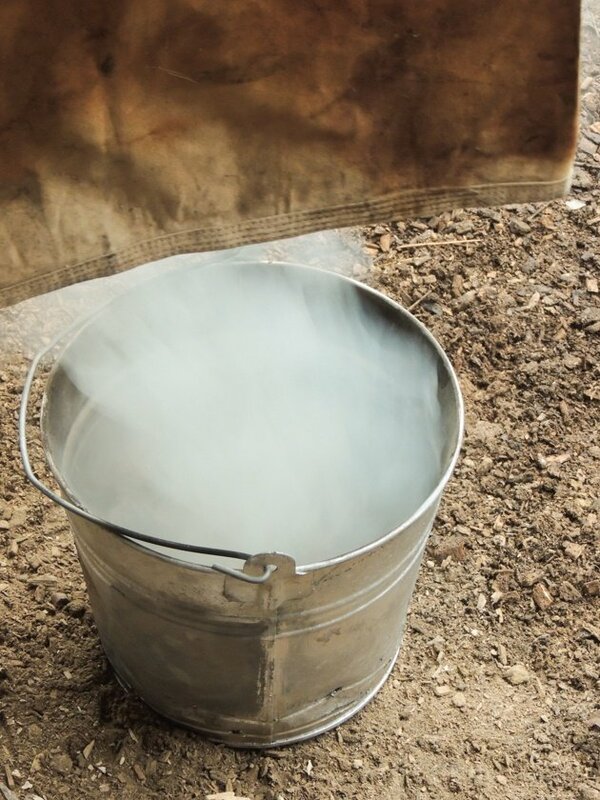 If it’s a new bucket that never had a fire burning in it go ahead and have a good fire before you use it to smoke your hide so it can release all the fumes and what-not from the galvanized metal. Before smoking your hide, you’ll have to go for a walk in the woods and find a lot of punk wood. Punk wood is very rotten dry wood. It has the consistency of a sponge and when you break it it doesn’t make much sound. 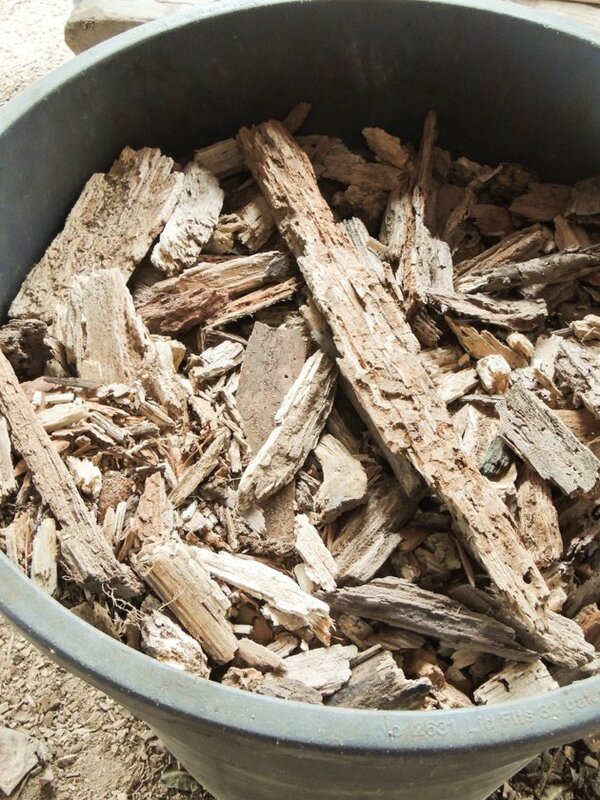 Make sure you have at least one 5-gallon bucket full of punk wood before you start. Find a place that you can hang a horizontal stick from and have a clip connected to that stick at each one of its ends. Those clips will hold the hide up. Here is how we put all this together. The two hides are hanging from the horizontal stick, held by the clips. The skirt is at the bottom and the bucket is right there under it all. Start a fire on the ground or in another bucket and scoop some of the hot coals into your smoking bucket. Place a few handfuls of punk wood on top of the coals and wait a minute for them to start smoking. 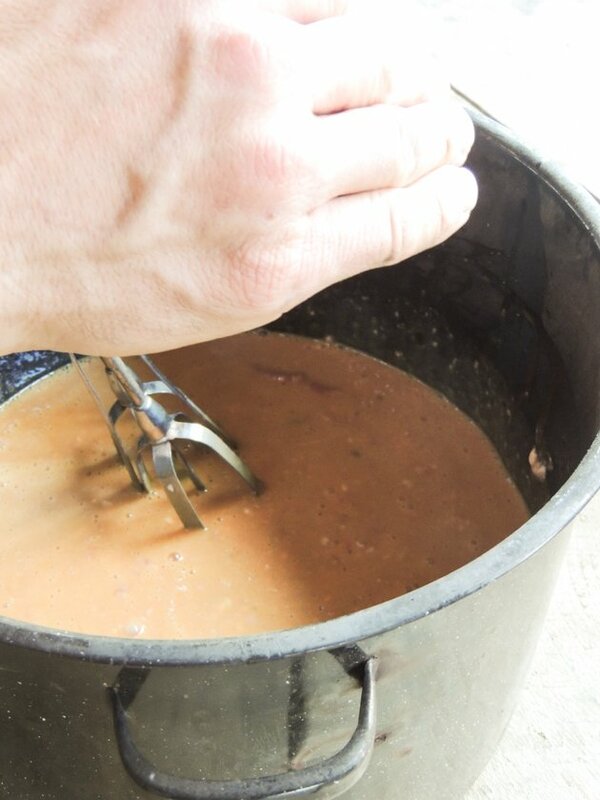 Dip half the length of the skirt in water and place it over the smoking bucket. 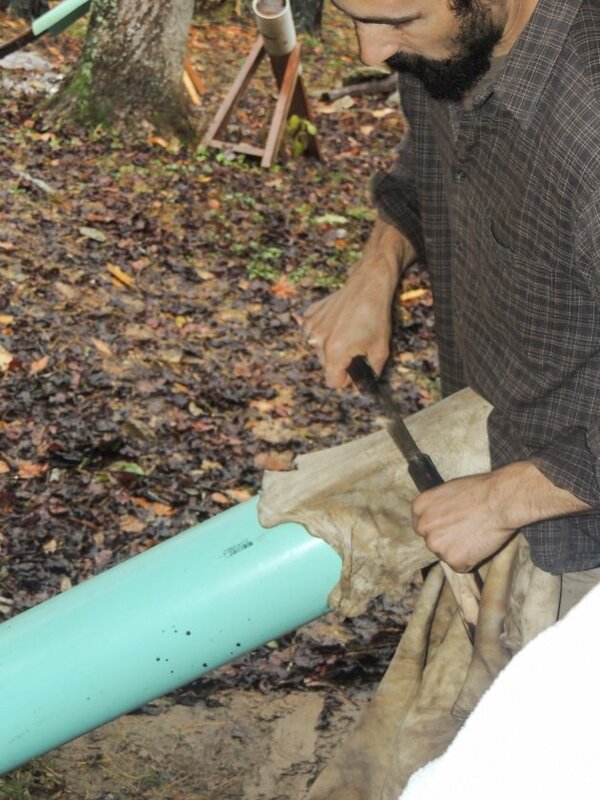 You can see that Tyler is fitting the skirt around the bucket with a clothespin. 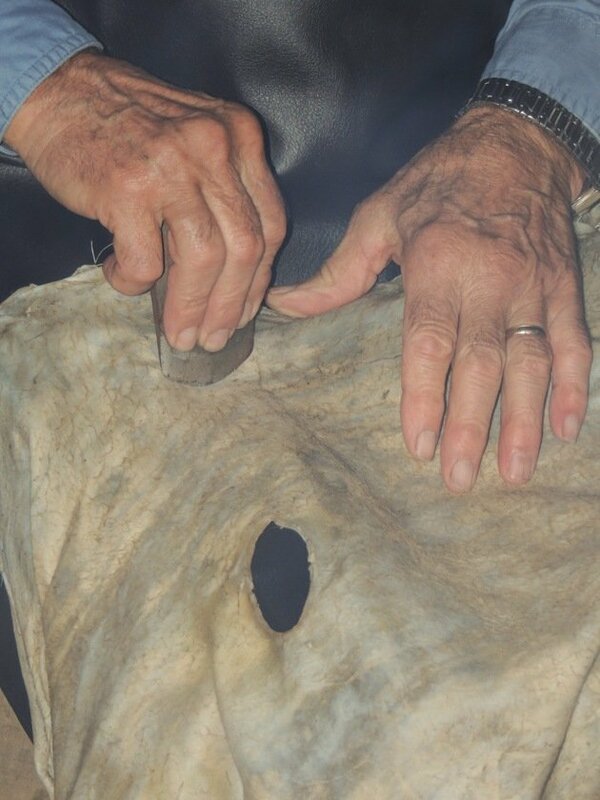 Use one of the holes in the hide to insert a stick in between the hides so that they are held apart and the smoke can reach the whole hide. Think of it as a ballon. 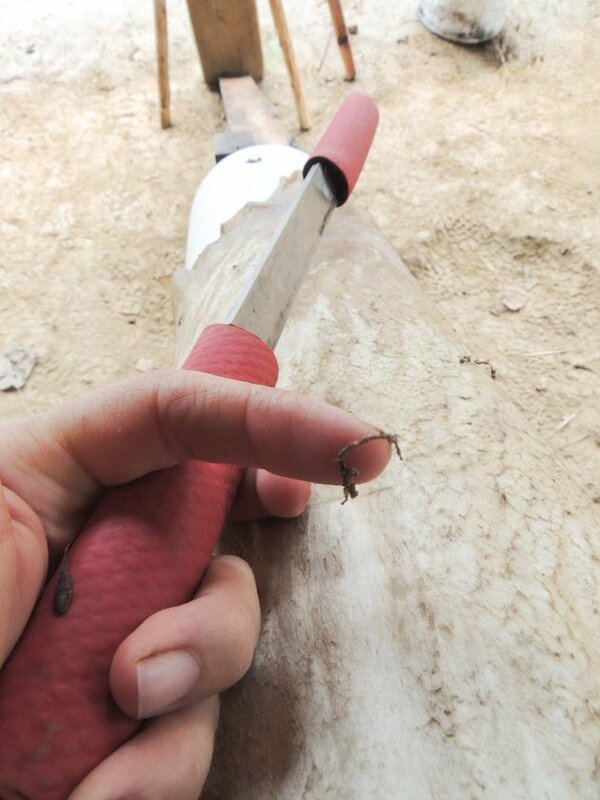 You want the stick to hold the hides away from each other from the inside. Or by sticking a piece of punk wood or any other kind of wood in them. We want to keep the smoke in there as much as we can. You CAN NOT leave your hide alone now. 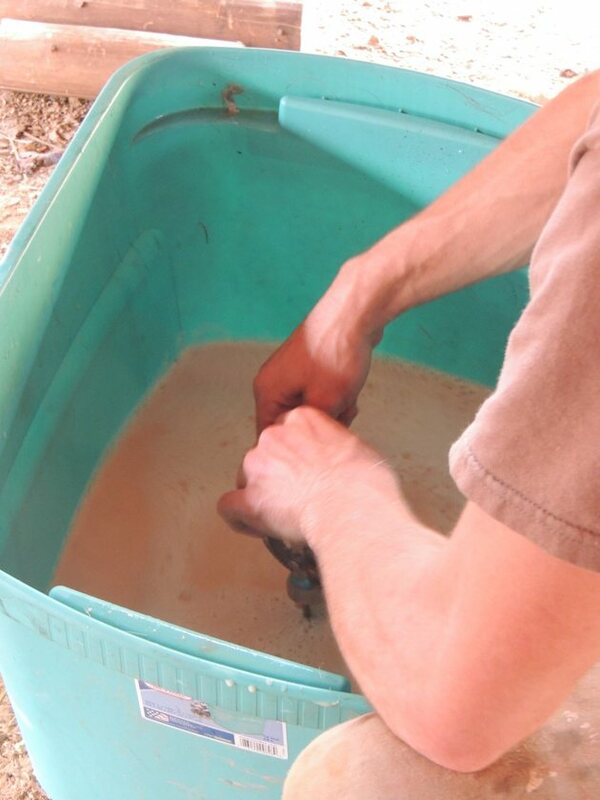 You have to stand right there and be very aware to ensure that there is no flare up in the bucket because that will burn your hide that you’ve put so much effort into already. So don’t go away and keep your eyes on that bucket. It’s not easy to spot a fire because the bucket is covered by the skirt so you have to pay close attention. Every ten minutes or so you’ll have to remove the skirt, add another handful of punk wood, and place the skirt over the bucket again. 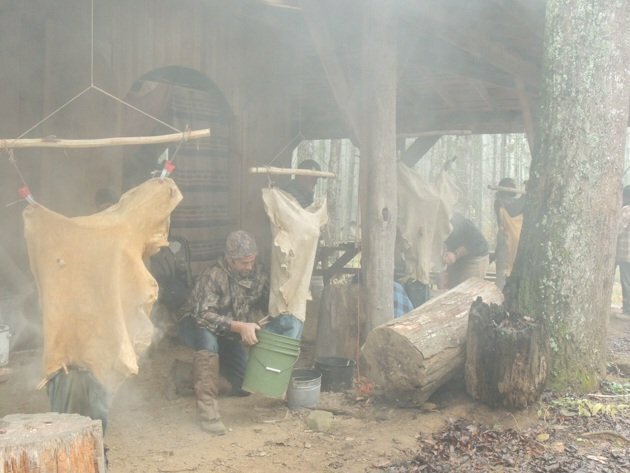 To be preserved, the hide has to be smoked for at least 45 minutes. You can pick inside through one of the holes and check if you like the color. After 45 minutes the color is going to be light brown. If you want your hide darker you can keep on smoking. Once you decide that you like the color, go ahead and take the hide off and gently flip it so you can smoke the other side (the membrane side). Once the membrane side is done you are the VERY proud owner of your own handmade buckskin! This is such an accomplishment and by this time you are probably completely in love with your piece of leather. You’ll see that the edges of your piece stay stiff so if you like you can use leather scissors to trim them. I found that it’s a bit difficult to free the hide from the smell of smoke. You have to leave it out in the breeze for a few days but it’s no big deal, it adds to the natural and handmade feel of it. You can work your leather into handbags, wallets, belts, moccasins, or clothing. I ordered this small beginner’s leather sewing kit from Amazon and I’m almost done setting up my tanning station at home. I have two more hides waiting for me in the freezer and once I have them turned into buckskins I’ll have more than enough material to work with. I think my first project is going to be along the lines of a woman’s tool belt/short skirt kinda thing. I am most comfortable in leggings when running after my kids, my animals, and while working in the garden, but I’m always missing the pockets jeans have. I love that it’s going to be custom made for me by me! It might not be perfect the first time but I’m excited to dive into the leather working world. Good to hear from you, Barbara! I hope all is well. What a great article. I’ve read lots of guides over the years on tanning hide. They always discouraged me because they left out the important details, or didn’t explain things well. Your article leaves me KNOWING that I could do this. I really like the additional tips you provide (like using egg yolks instead of brains…who knew!). You explain every step thoroughly, and emphasize that it’s ok if things aren’t perfect. That encouragement makes all the difference for someone who’s never done something. Thanks a lot! Thank you for the feedback, Richard! I feel the same about many articles that I read. I often feel like I am still not sure how to do the task when I am done reading them and this experience is what pushed me to set my blog posts the way I do. Hide tanning is a lot of work but it really doesn’t have to be perfect. And it’s a lot of fun! Excellent article! Seems to cover everything. I am anxious to give it a try. Do you have any info on leaving the hair on the hide? Might be fun to do one for a rug or something. 4. Wring well. On the hir side you can use a hair dryer to dry the hair a little bit. 5. 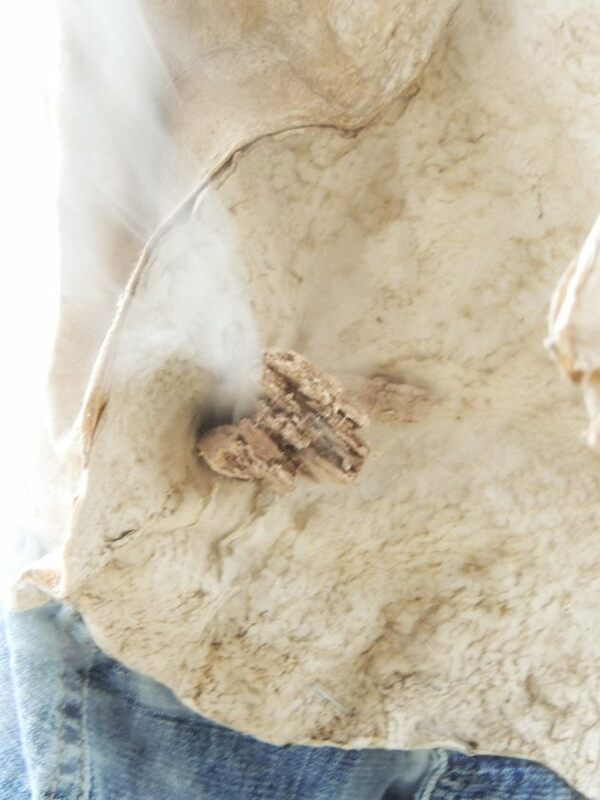 Brain the fleshed side and fold the hide so skin touches skin (hair doesn’t touch the brain solution). wrap in a towel and leave for two hours. 6. Open, brain again, wrap and leave for a couple of hours again. 7. Rinse in warm water. 8. Dry hair with a dryer but not completely. Start the softening process. I’ve done this with raccoon and rabbit but never with deer. Definitely on my list. I want a rug too! 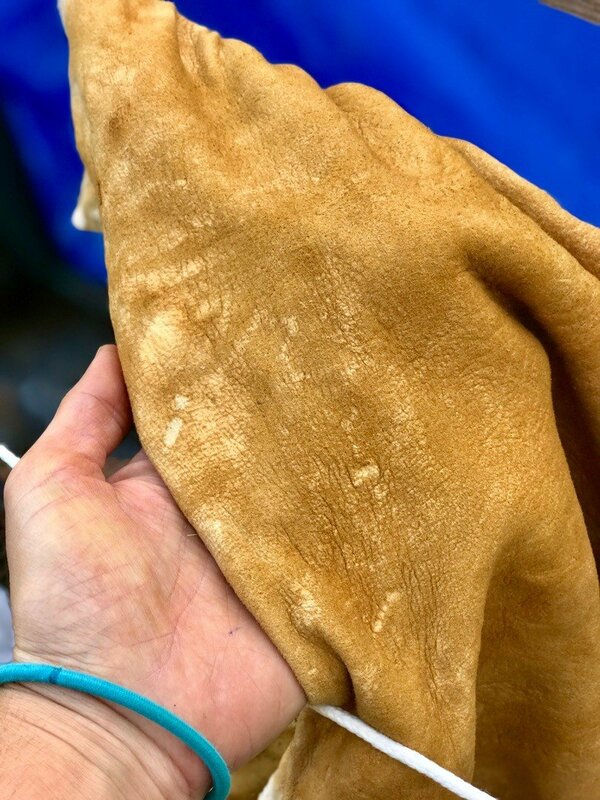 I am very interested I learning how to tan hides..
It’s a hard job but the result is amazing and I personally love the labor.